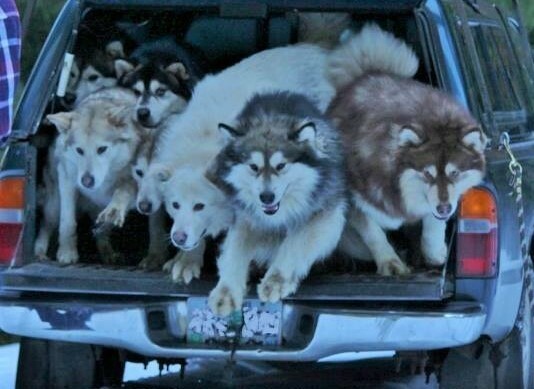 Alabama (AL), Alaska (AK), Arizona (AZ), Arkansas (AR), California (CA), Colorado (CO), Connecticut (CT), Delaware (DE), Florida (FL), Georgia (GA), Hawaii (HI), Idaho (ID), Illinois (IL), Indiana (IN), Iowa (IA), Kansas (KS), Kentucky (KY), Louisiana (LA), Maine (ME), Maryland (MD), Massachusetts (MA), Michigan (MI), Minnesota (MN), Mississippi (MS), Missouri (MO), Montana (MT), Nebraska (NE), Nevada (NV), New Hampshire (NH), New Jersey (NJ), New Mexico (NM), New York (NY), North Carolina (NC), North Dakota (ND), Ohio (OH), Oklahoma (OK), Oregon (OR), Pennsylvania (PA), Rhode Island (RI), South Carolina (SC), South Dakota (SD), Tennessee (TN), Texas (TX), Utah (UT), Vermont (VT), Virginia (VA) , Washington (WA), West Virginia (WV), Wisconsin (WI), Wyoming (WY here to edit this text. 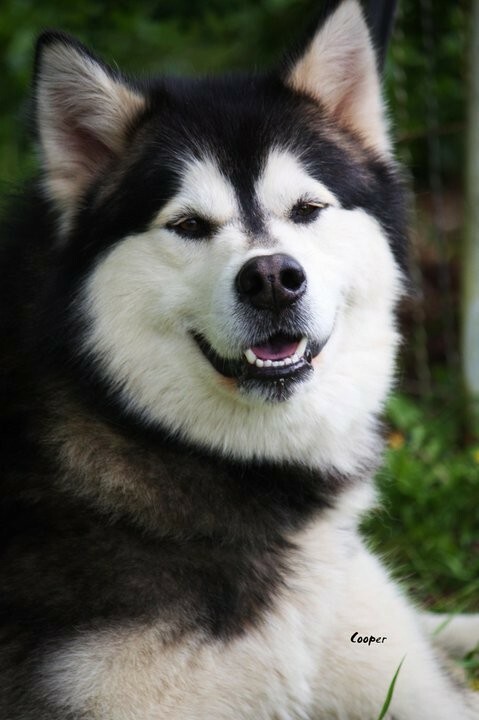 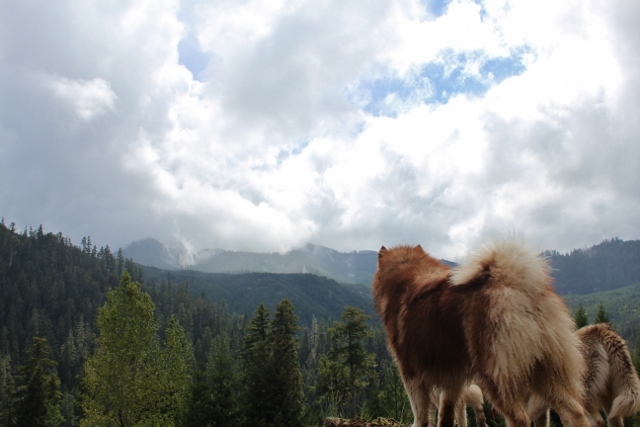 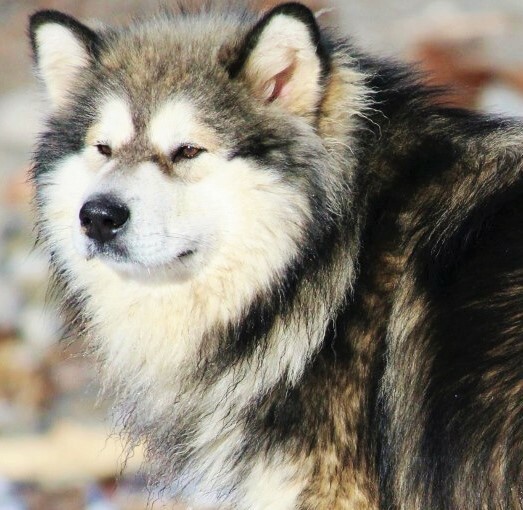 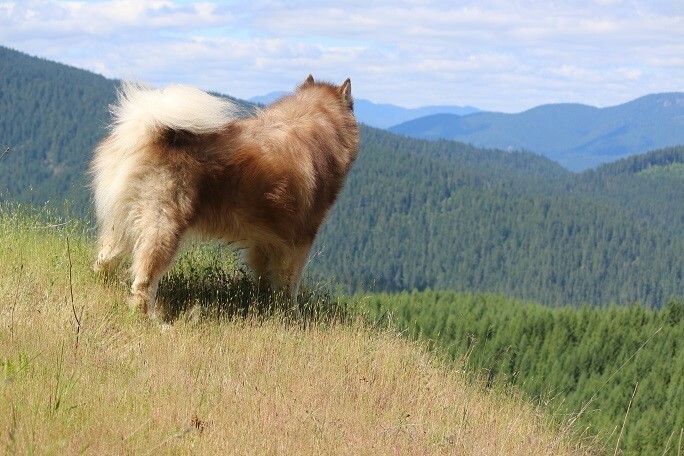 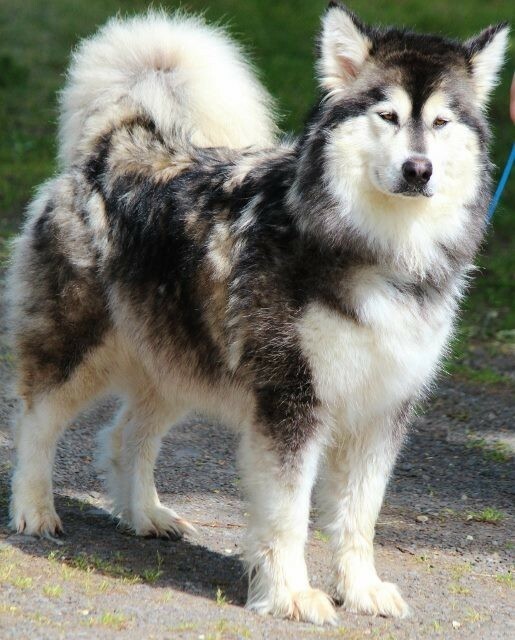 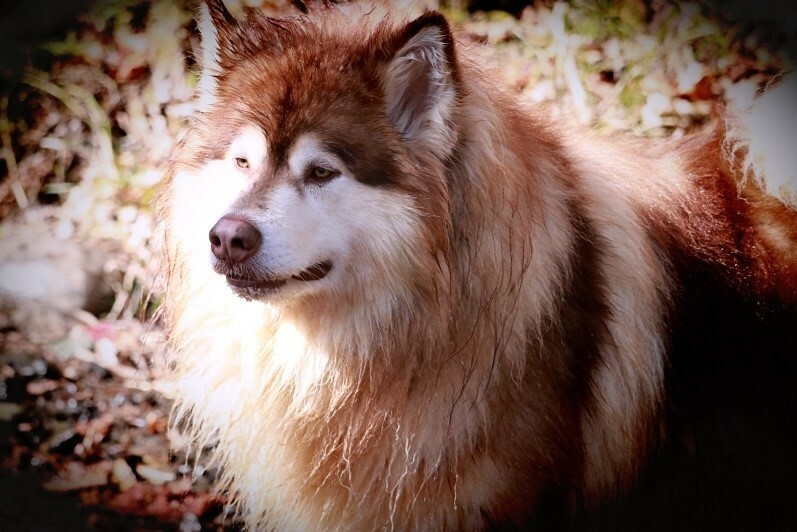 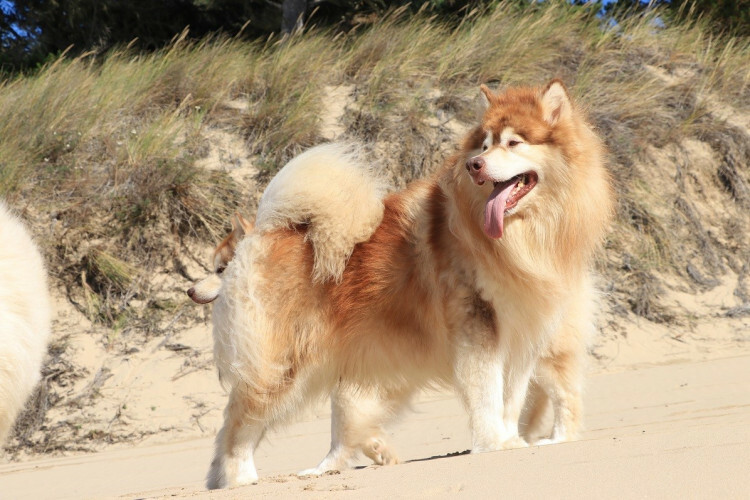 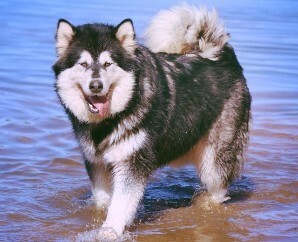 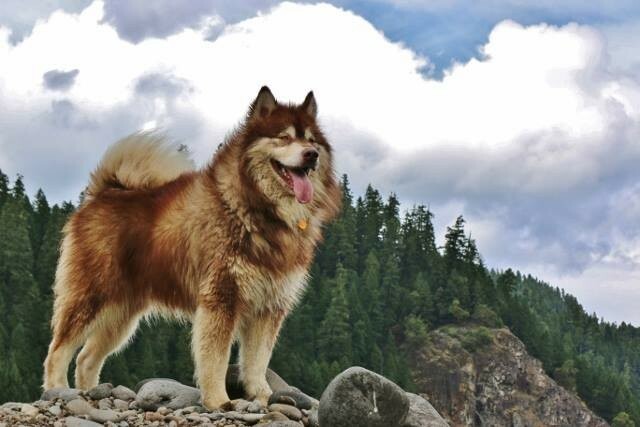 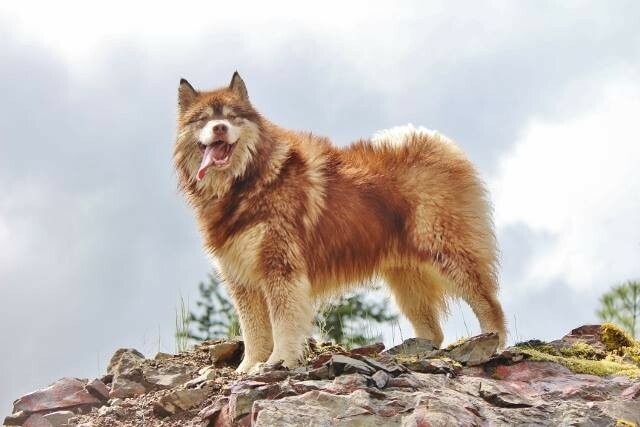 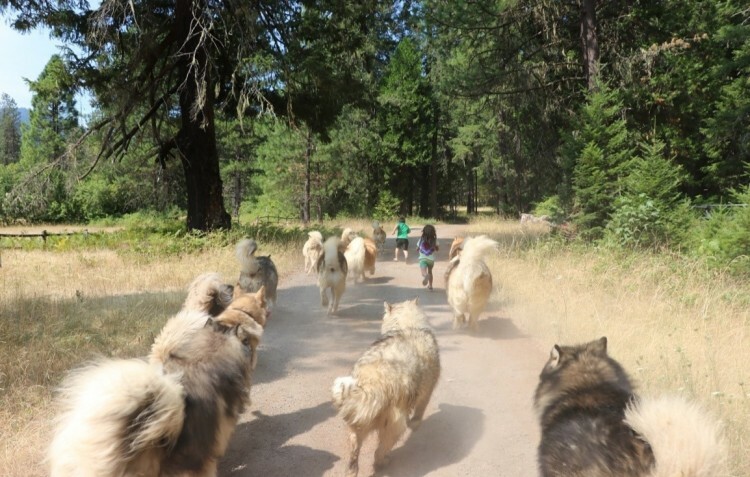 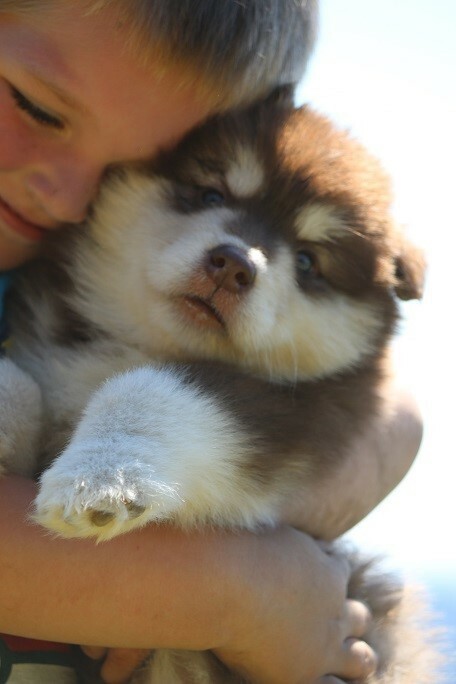 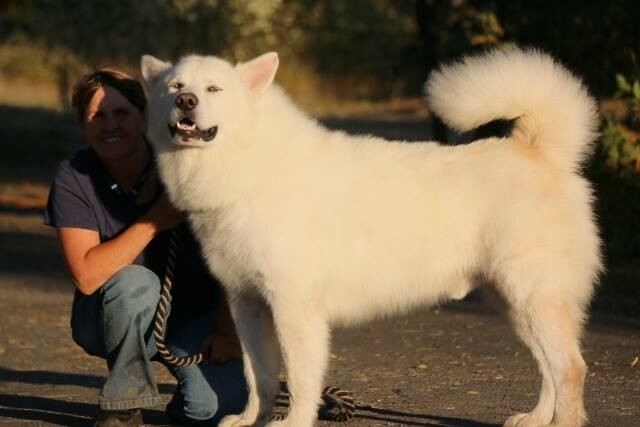 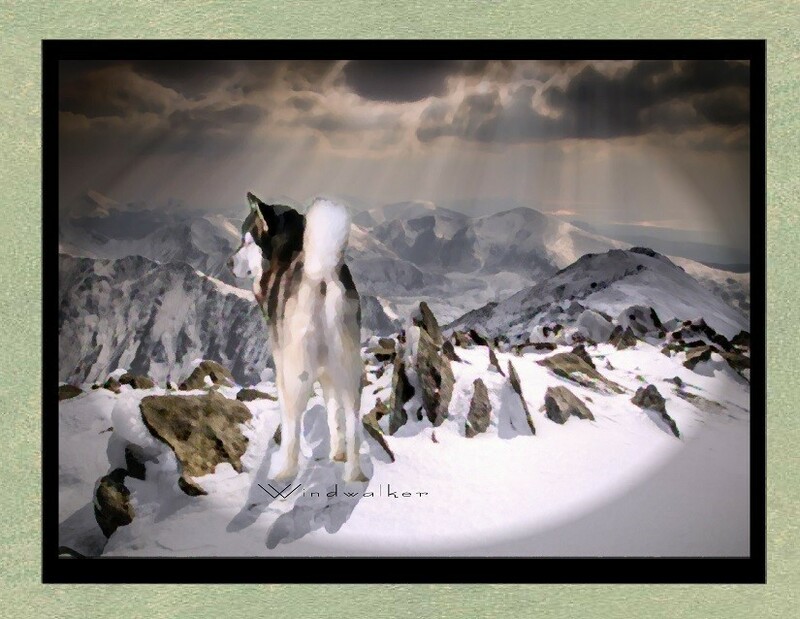 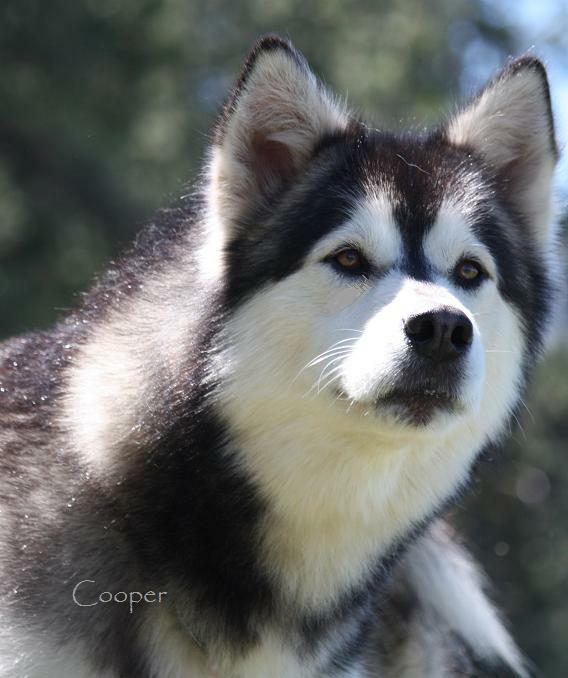 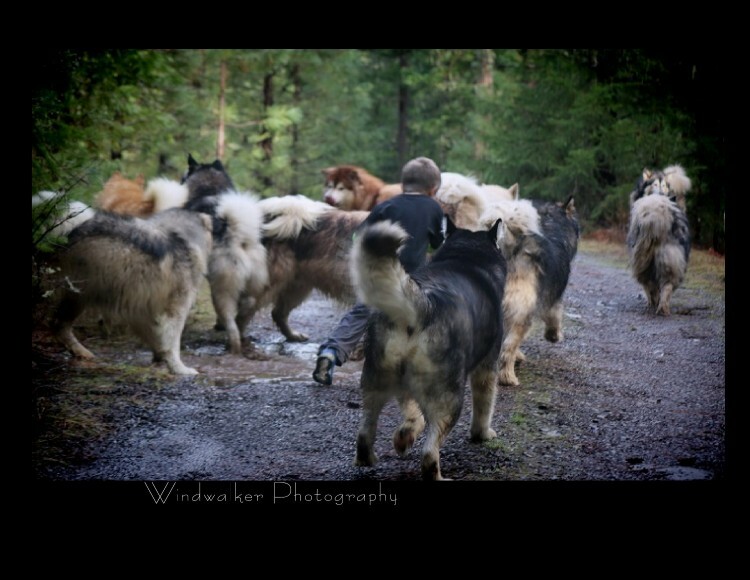 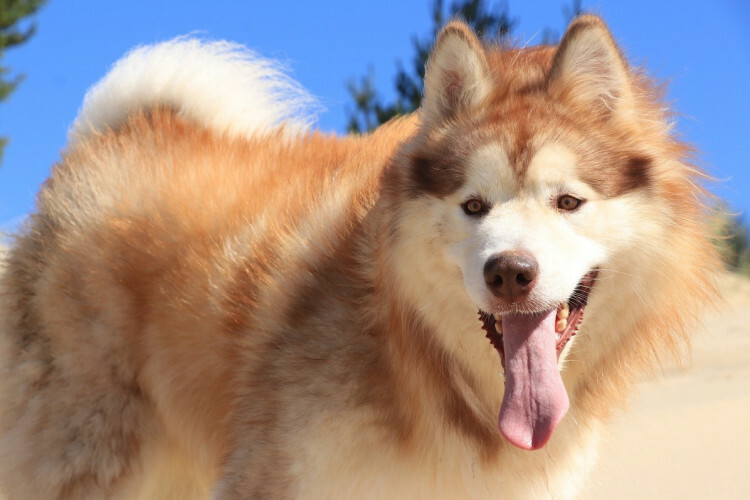 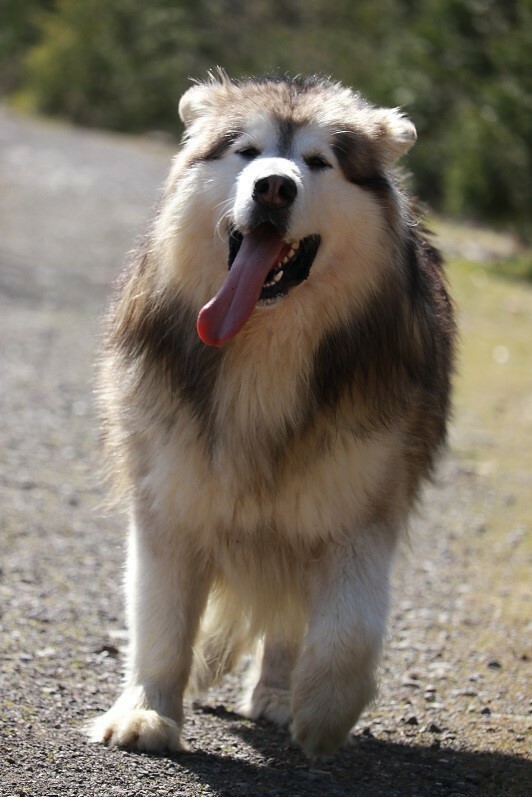 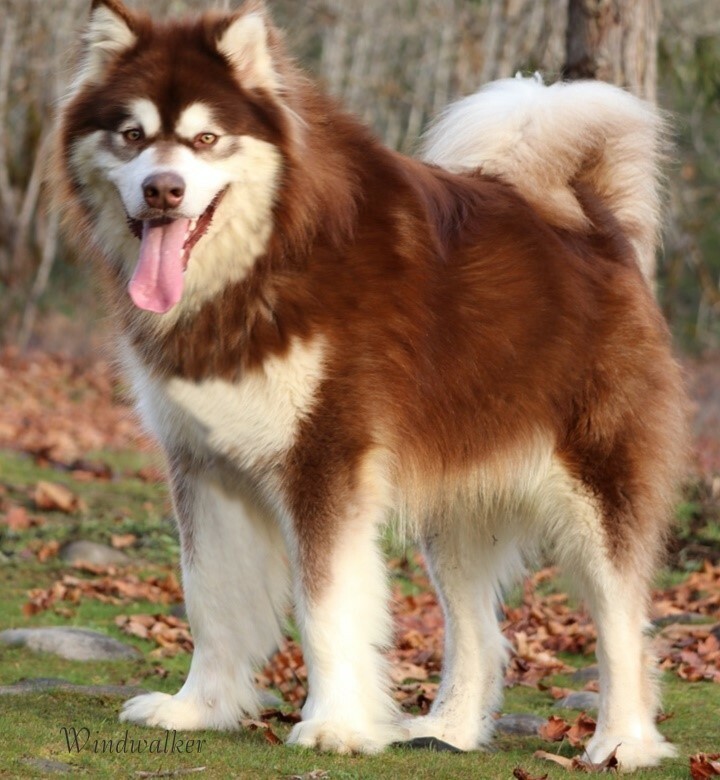 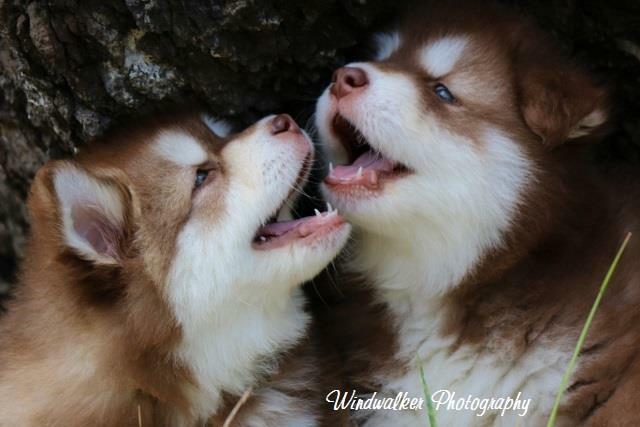 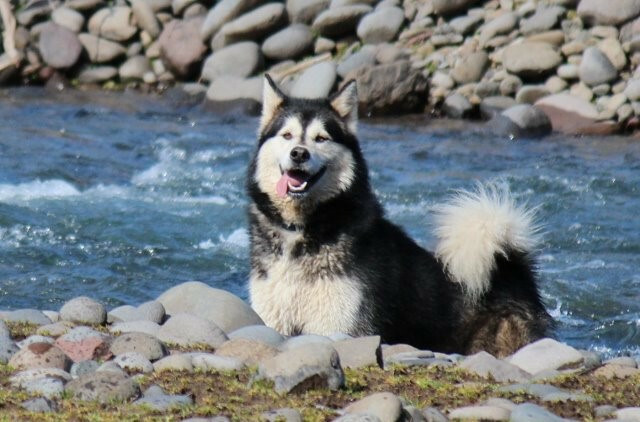 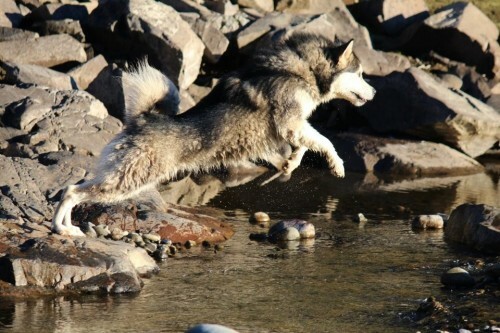 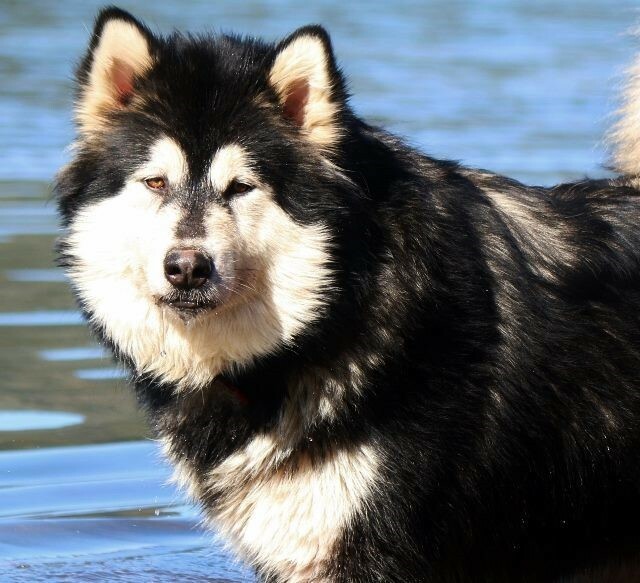 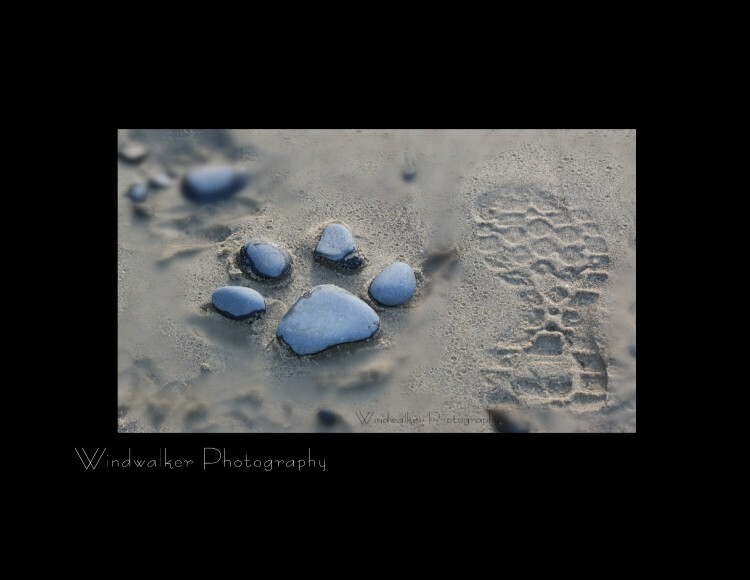 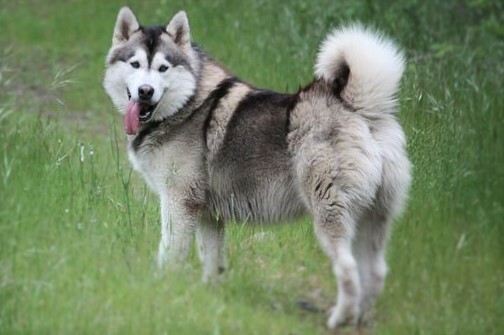 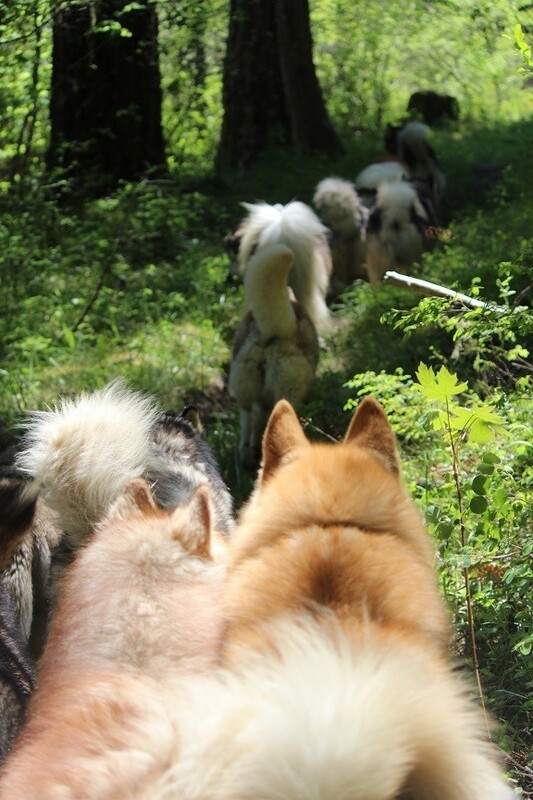 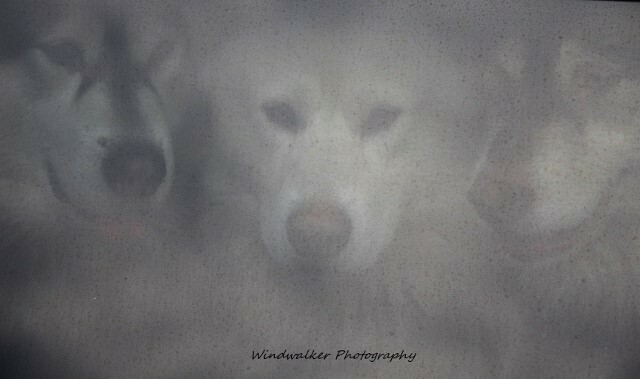 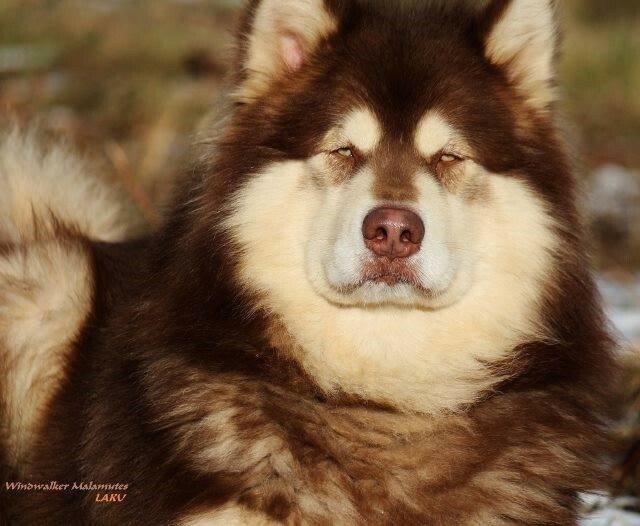 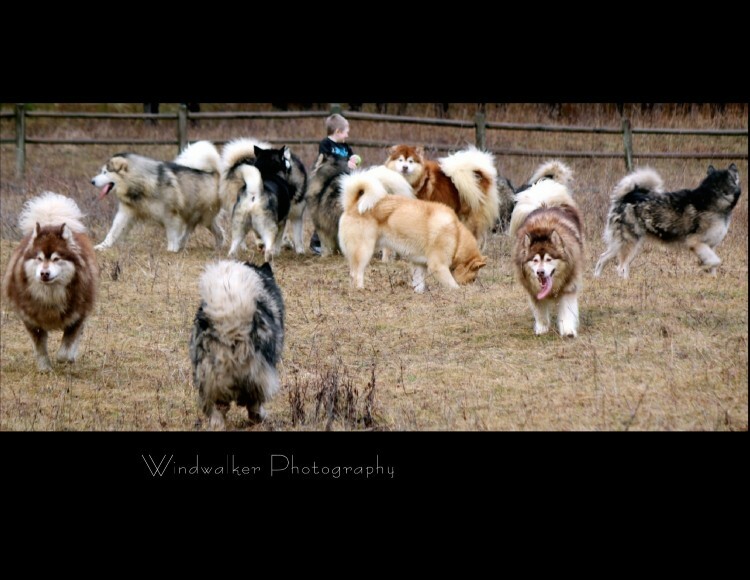 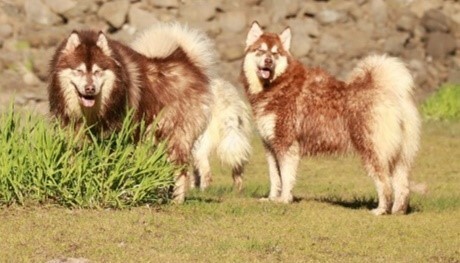 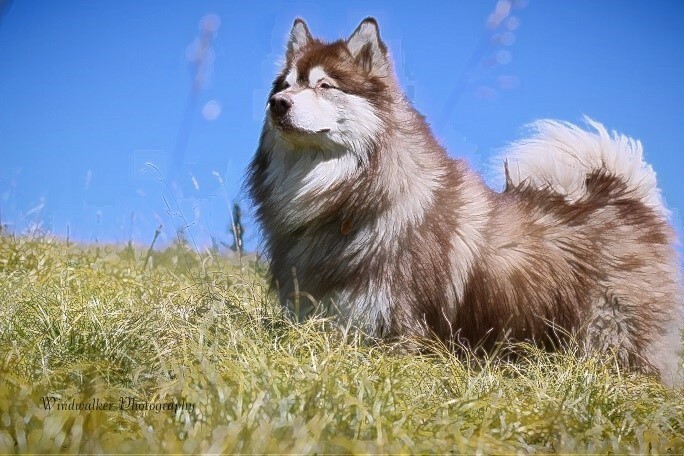 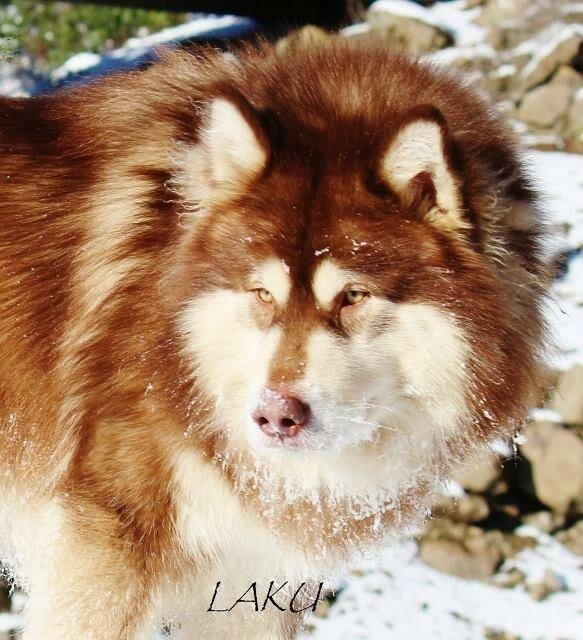 At Windwalker Malamutes, we are dedicated to the idea's of keeping the customs of this wonderful breed's heritage alive. 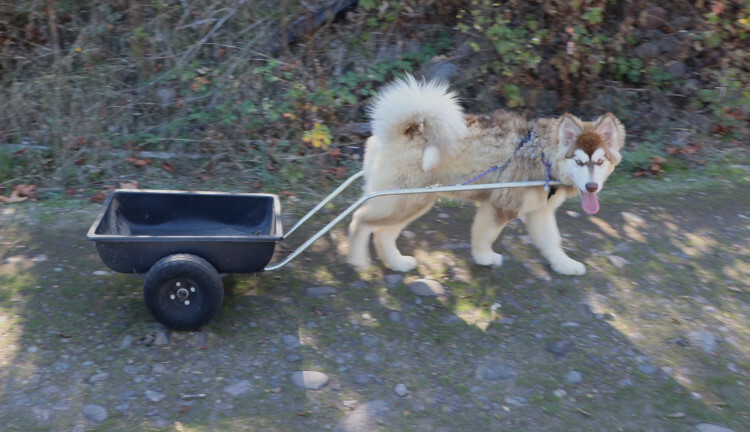 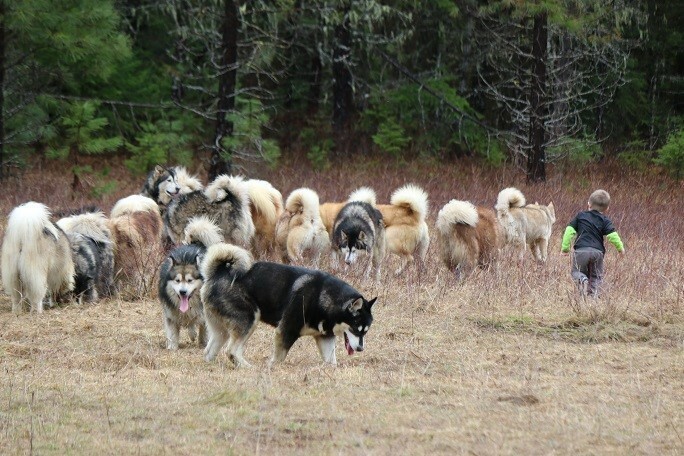 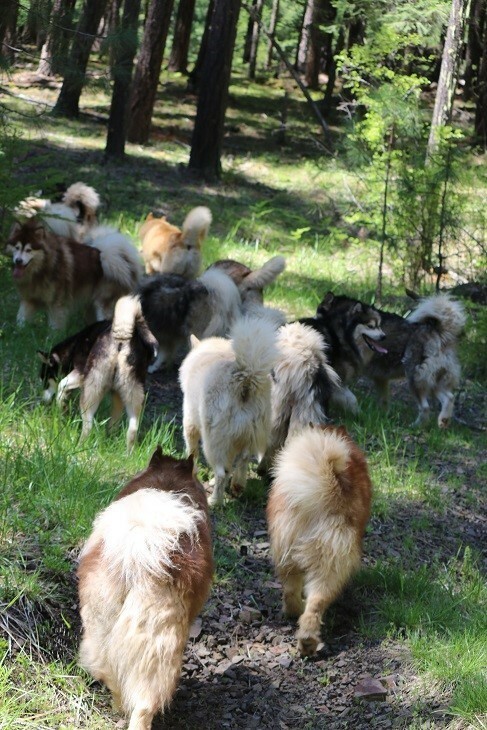 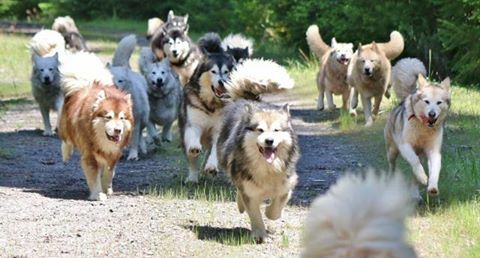 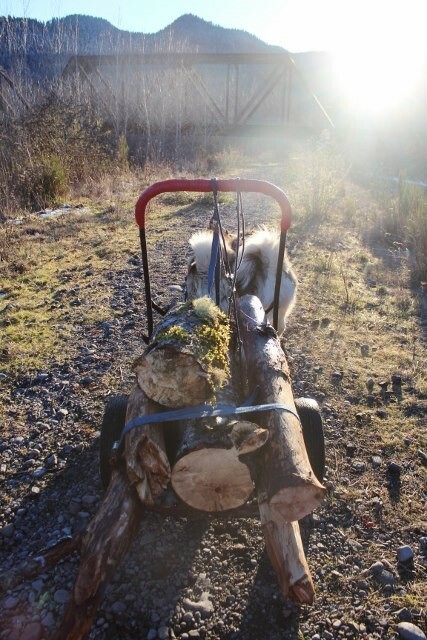 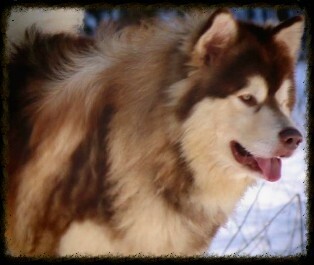 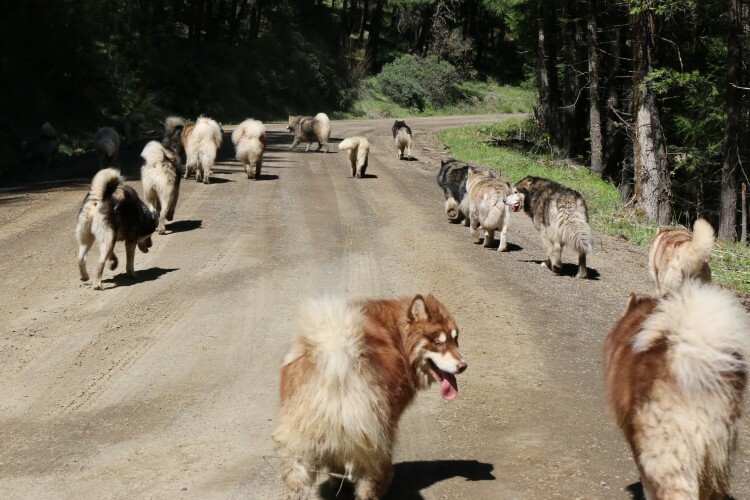 We play hard and Work hard with our Malamutes so they learn and maintain the heritage that they were bred for. 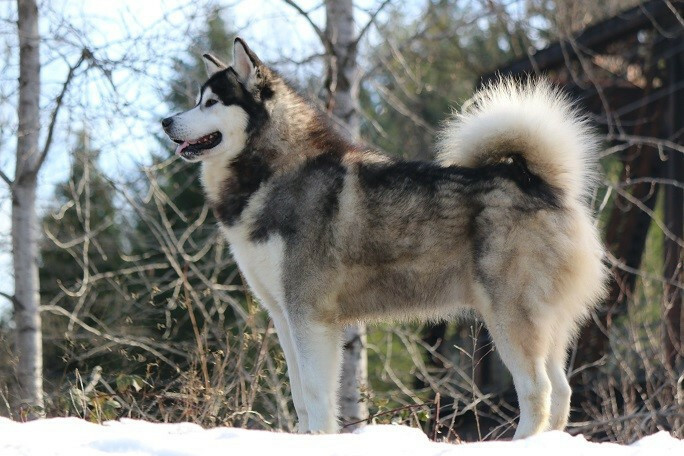 The Alaskan Malamutes is a Working breed and they were bred to do heavy pulling in some of the harshest climates known to man. 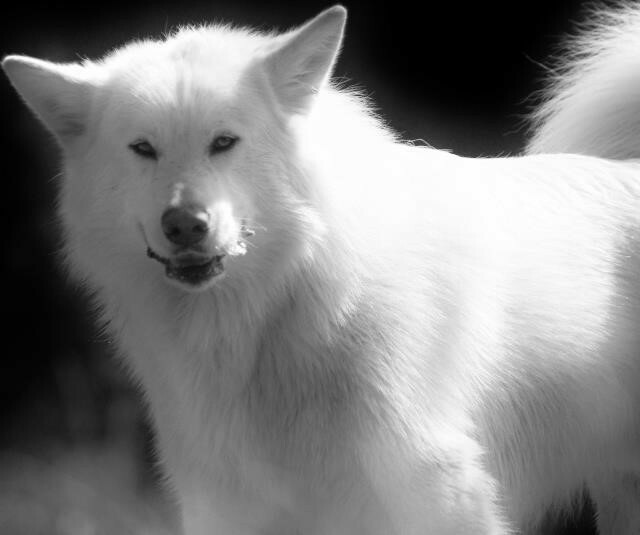 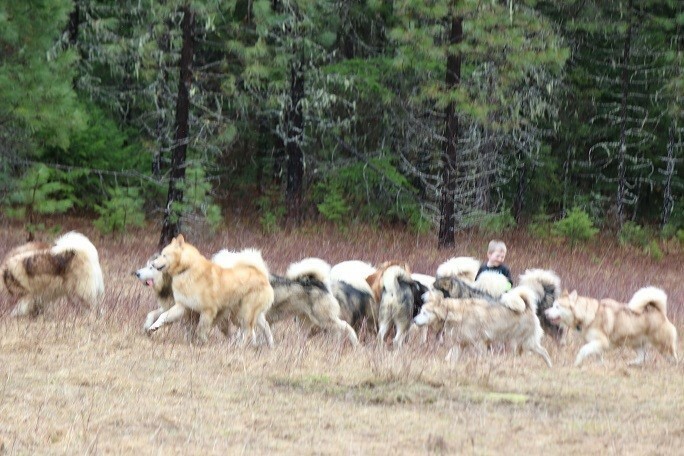 Though Oregon is not Alaska or the arctic, we have conditions here that test our dogs, so that they can maintain their heritage. 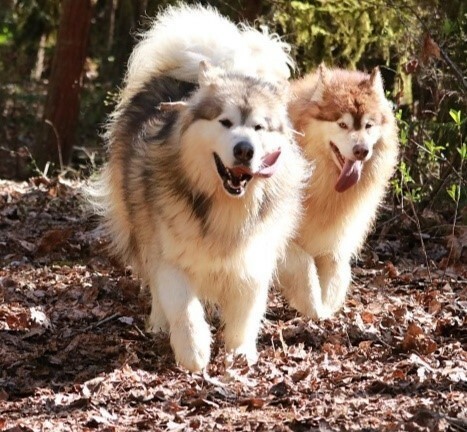 Though they may look cute and soft as babies, they are hardworking, hard playing companions, that never fail to amaze us. 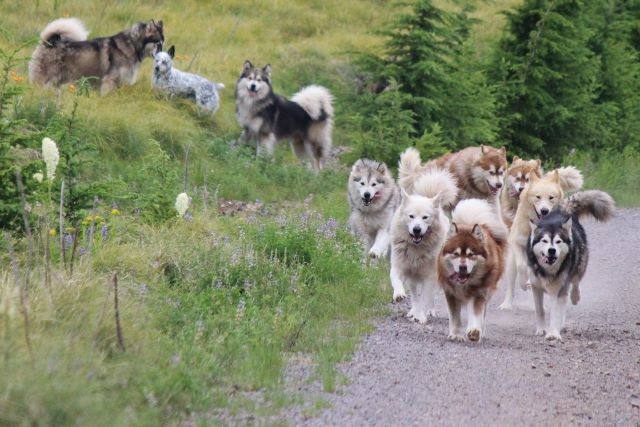 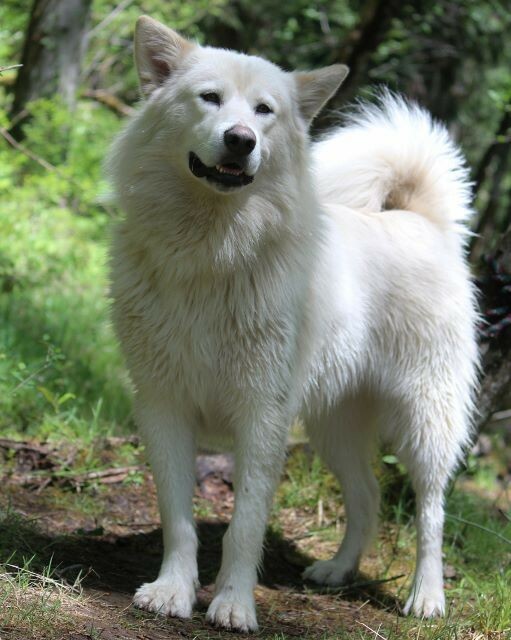 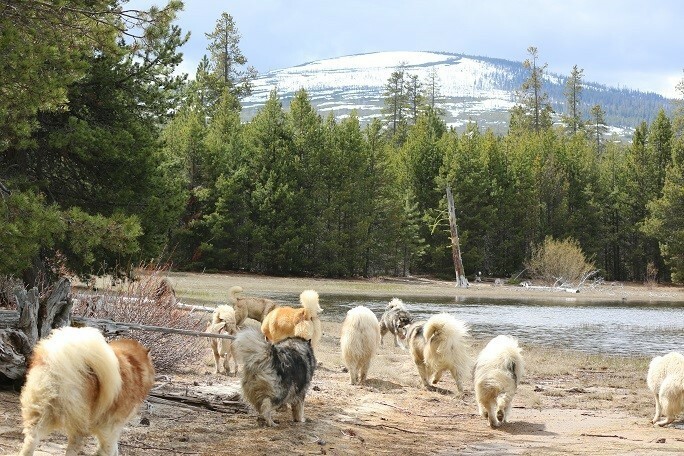 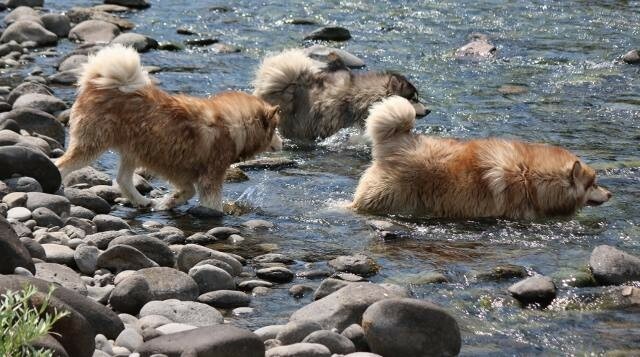 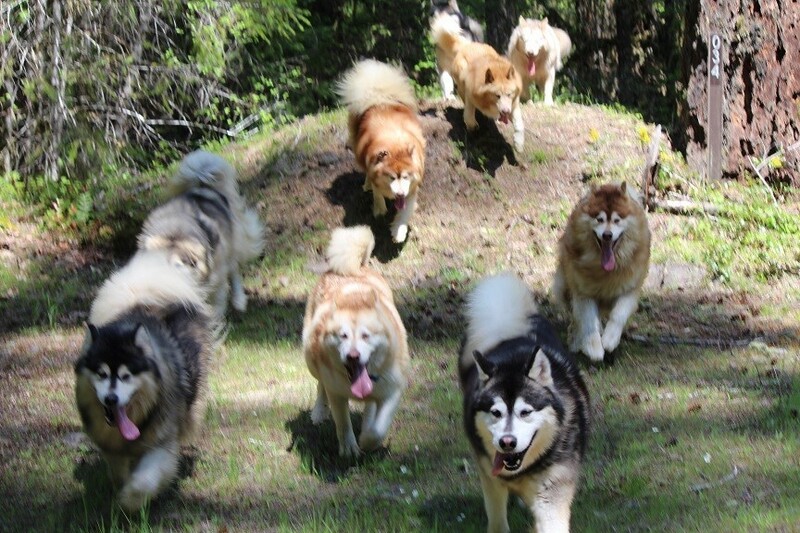 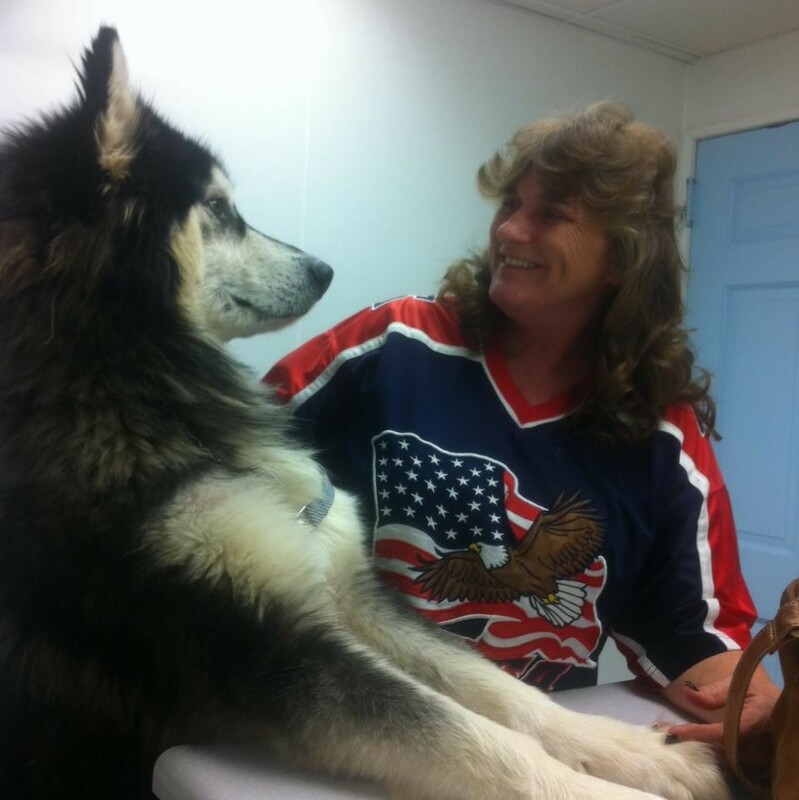 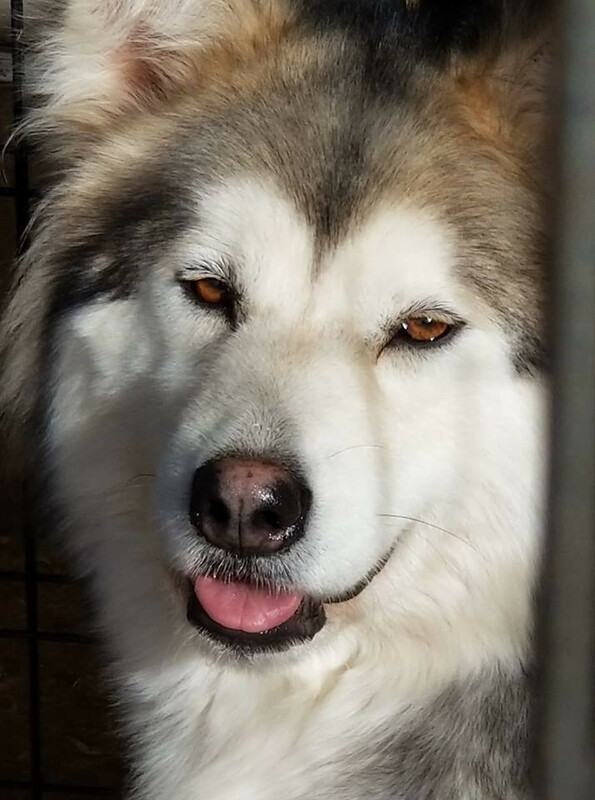 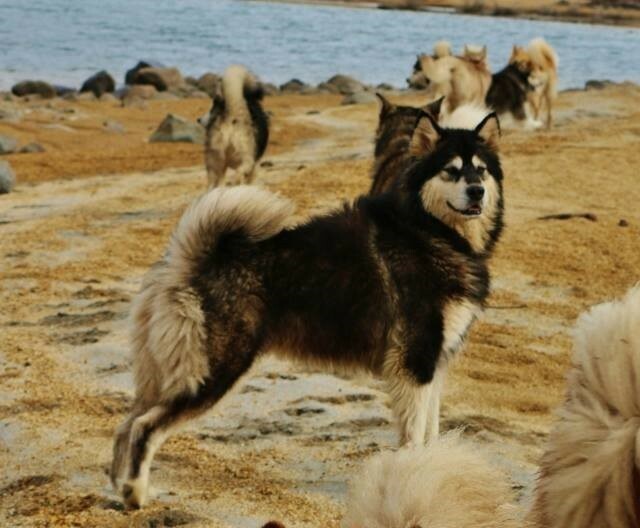 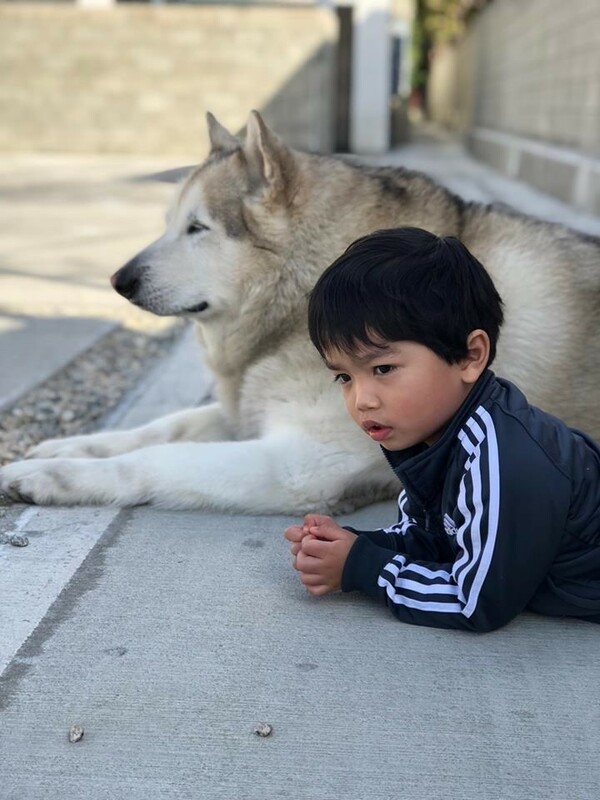 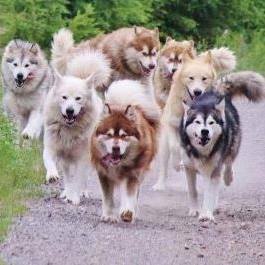 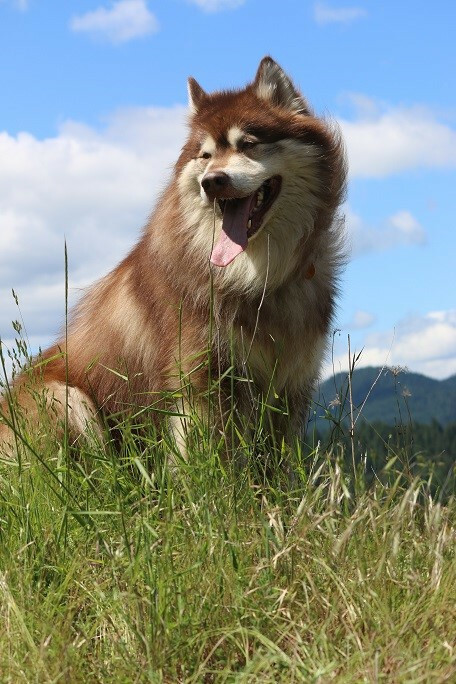 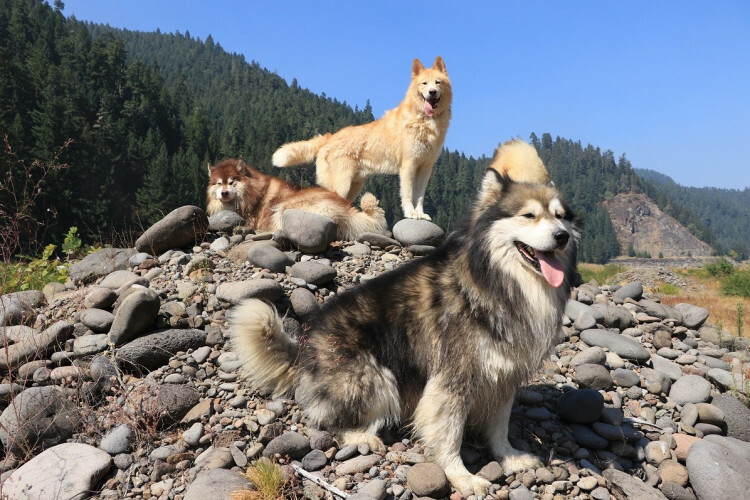 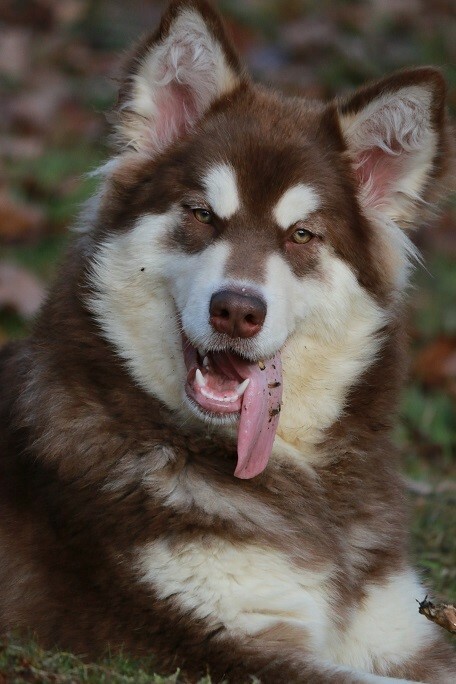 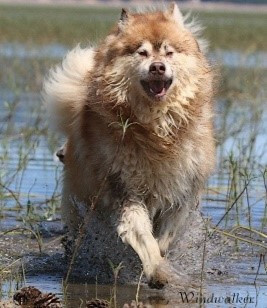 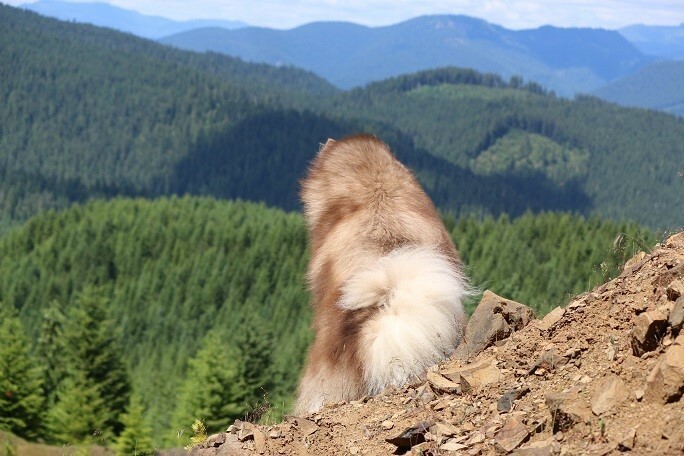 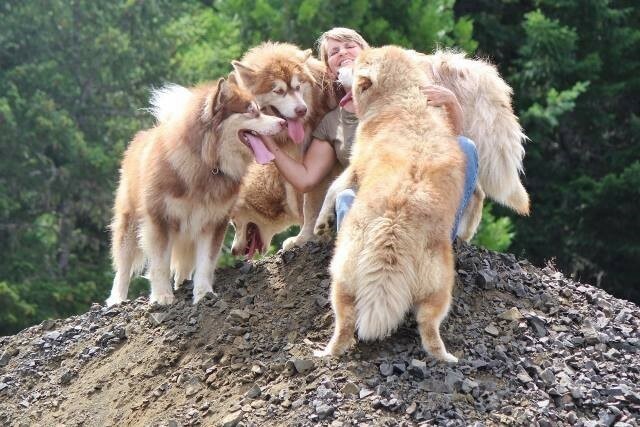 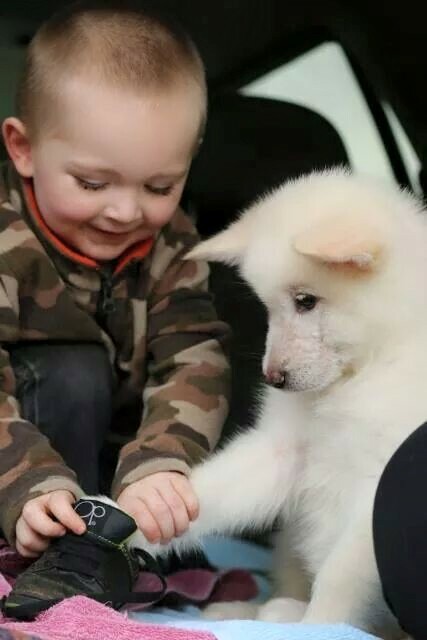 ​Thank you for looking at our site and at our Alaskan Malamutes and it is our hope that you have a great experience while you are visiting. 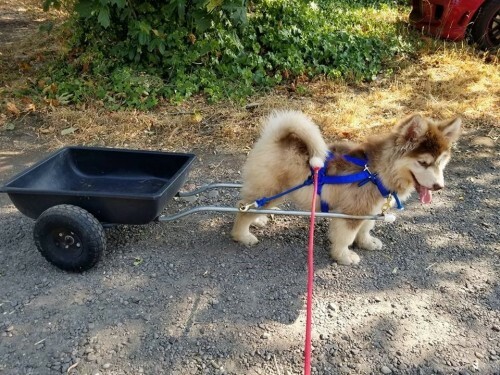 Please stop by often, as this site is always under construction . 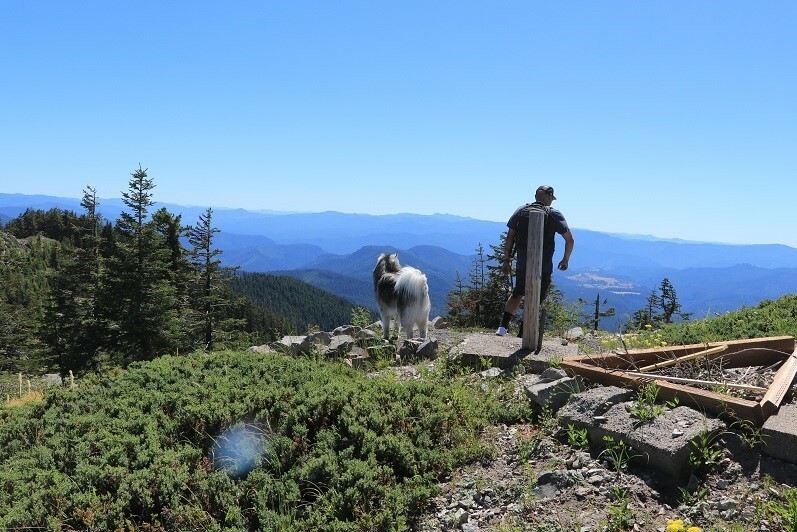 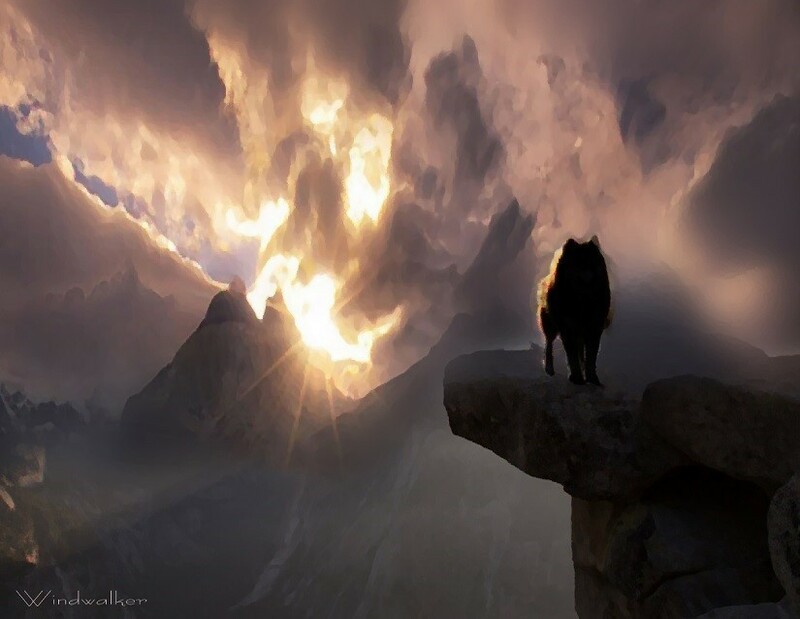 Always Looking for new heights and Adventures with our dogs, to test and work them. 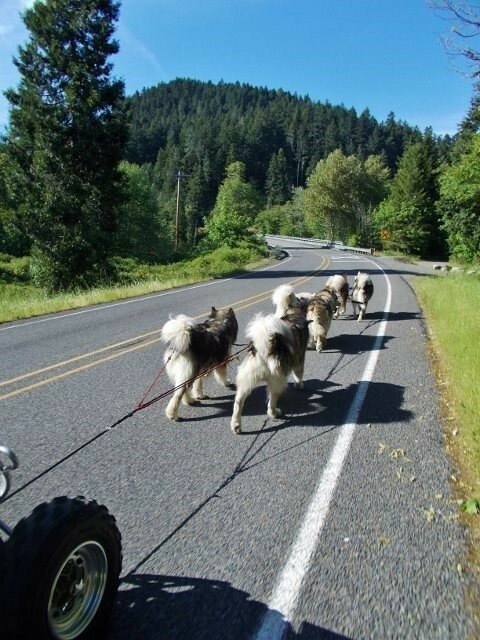 This keeps them in shape and ready to work. 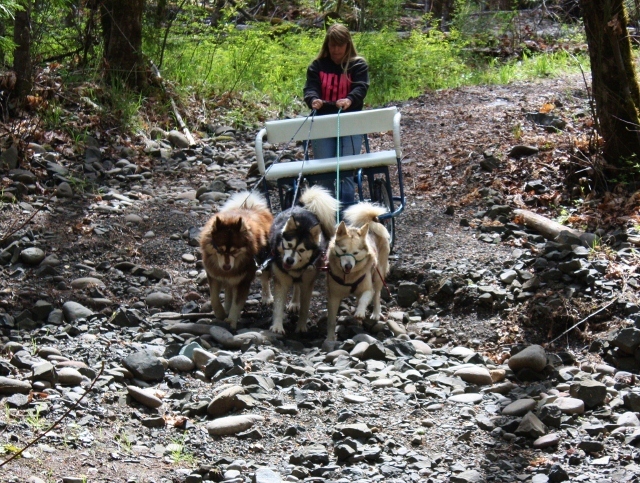 It doesn't matter if we are Hiking the Dry dusty trails in the summer months, or we are carting the trails in the winter months. 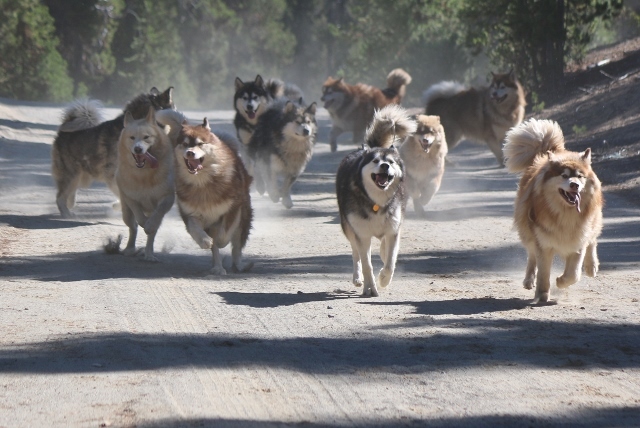 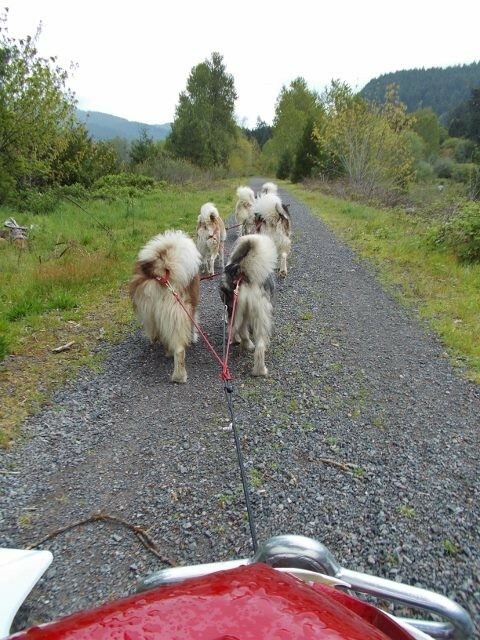 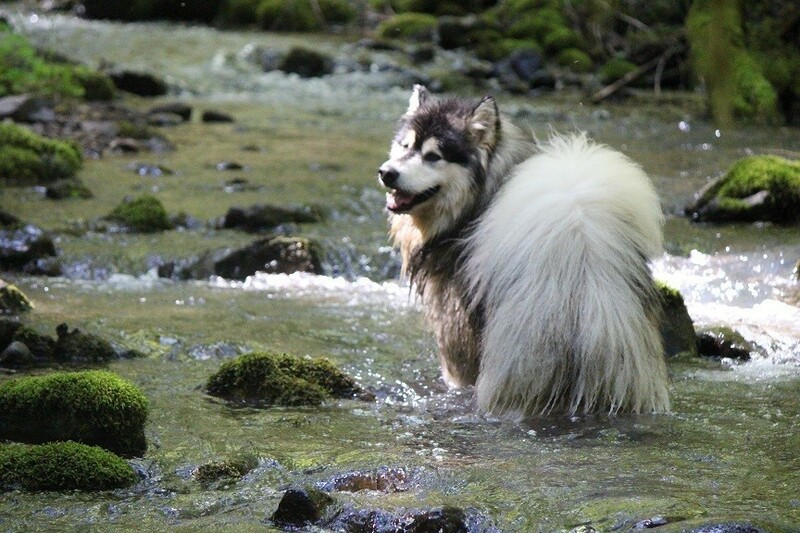 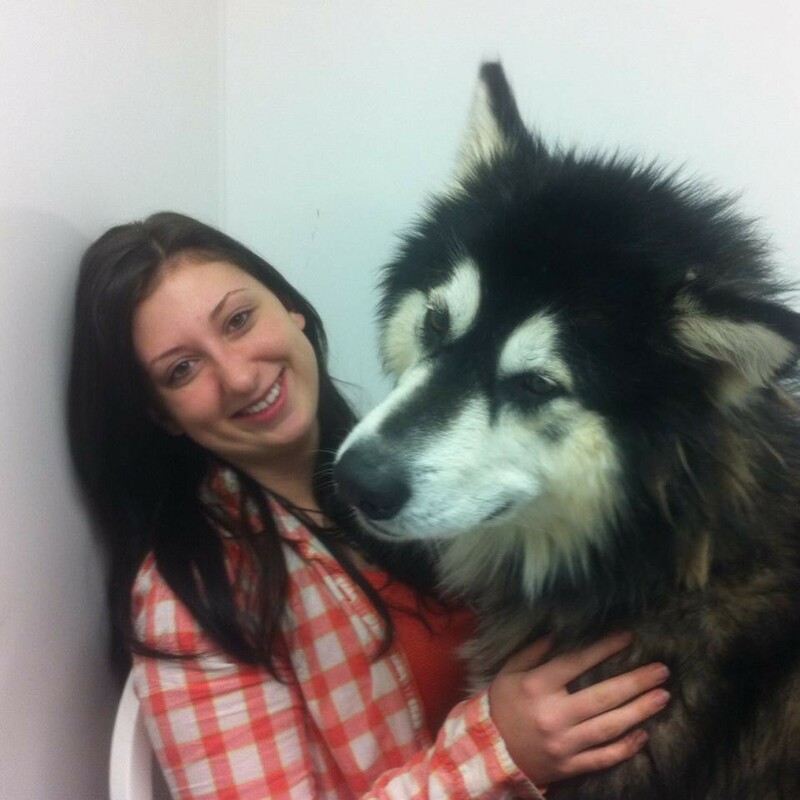 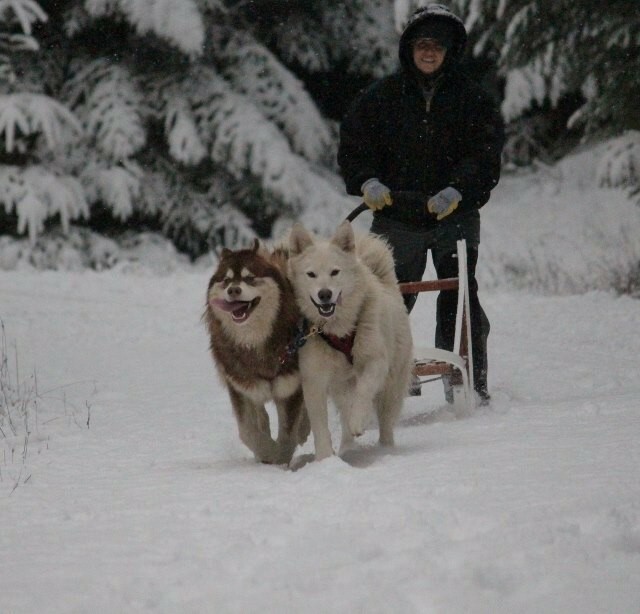 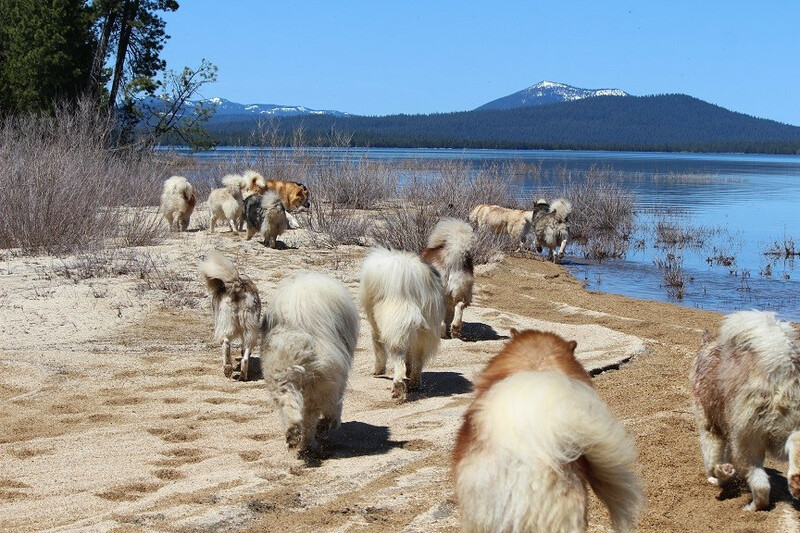 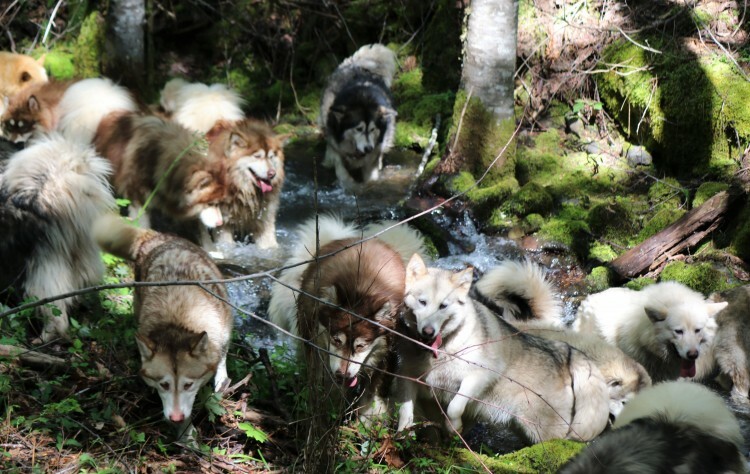 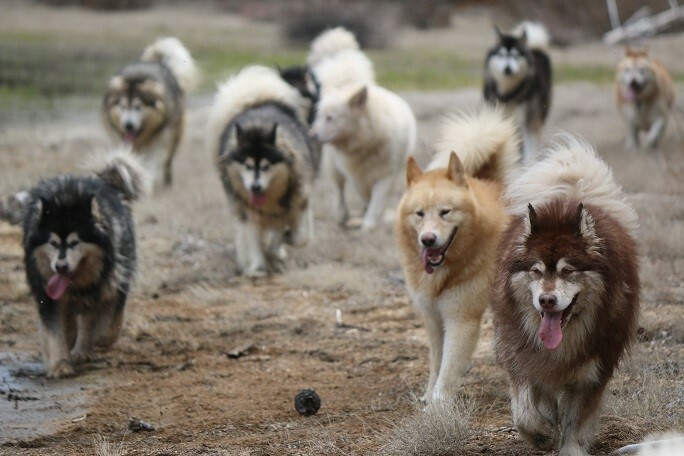 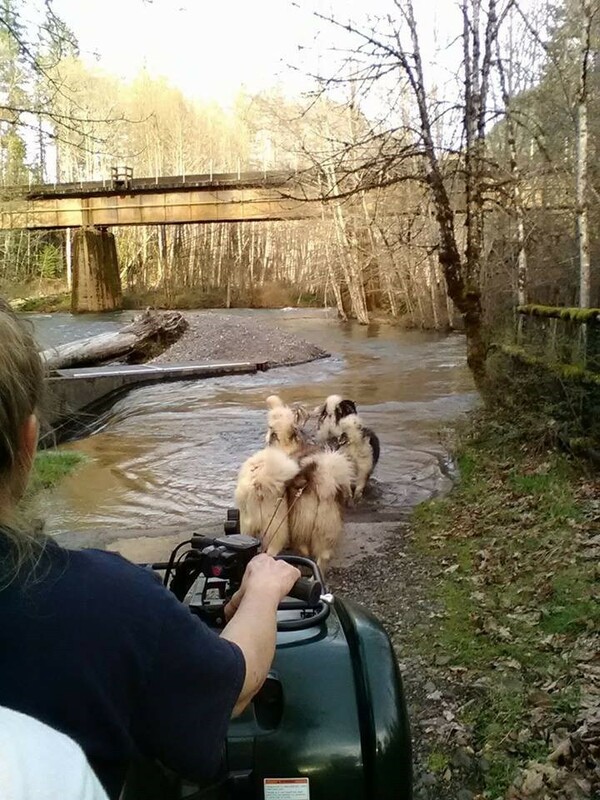 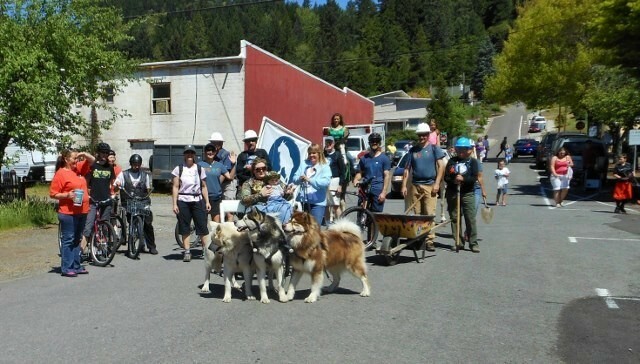 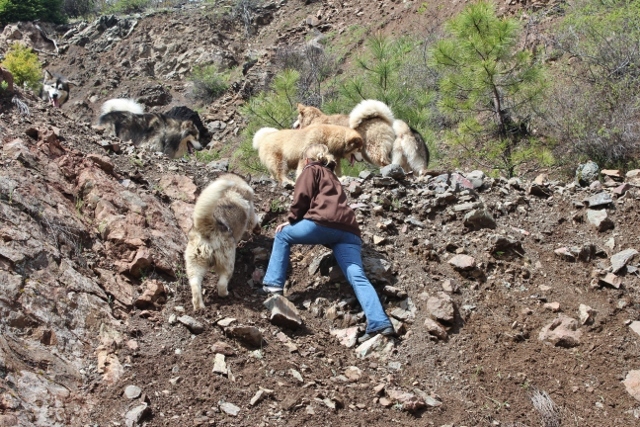 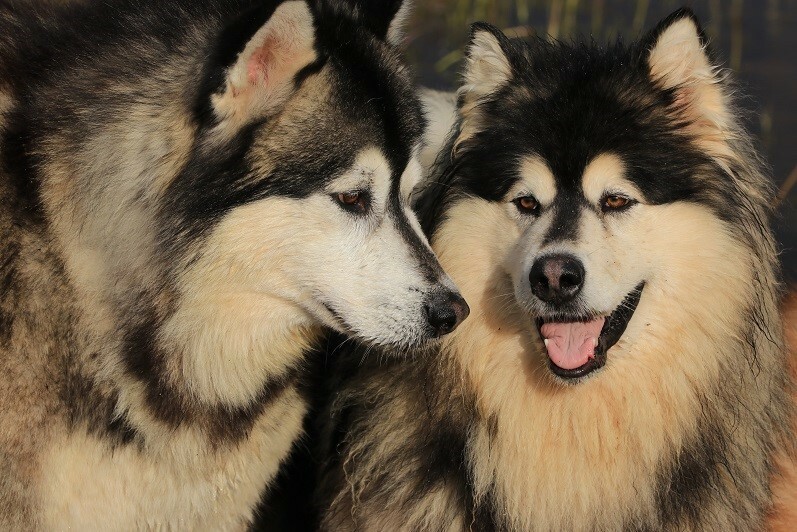 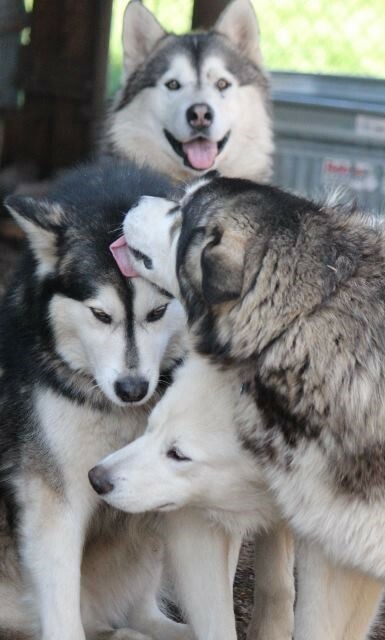 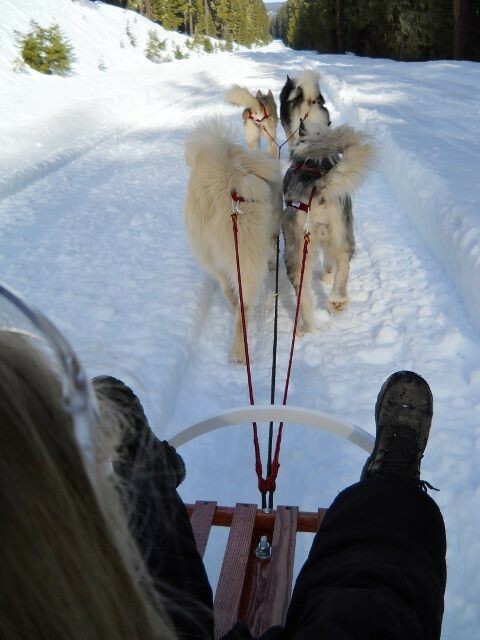 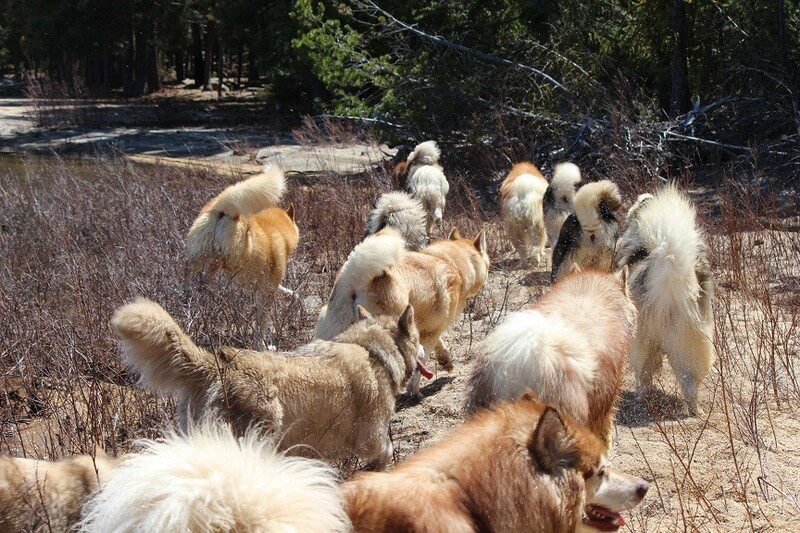 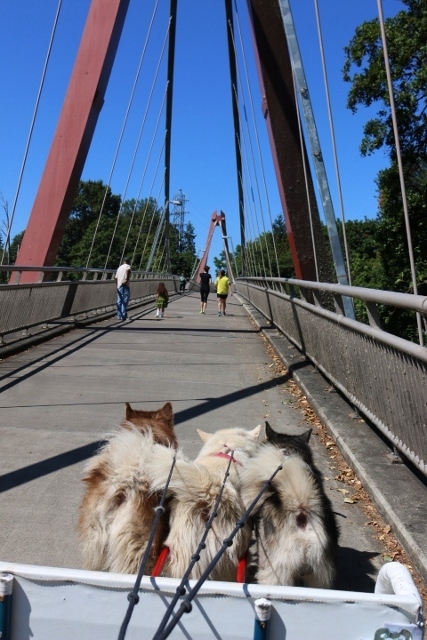 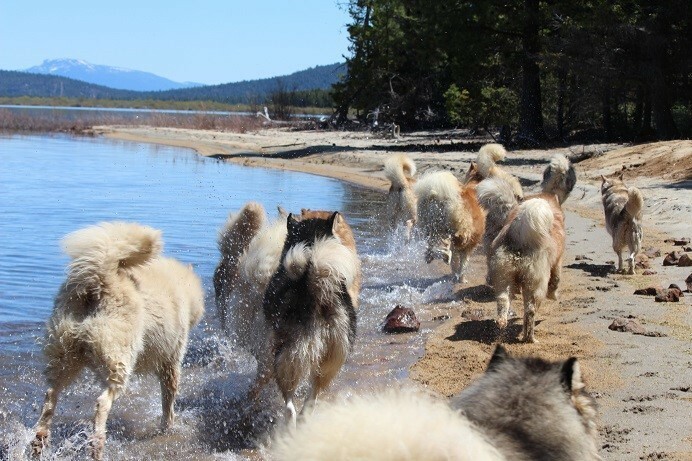 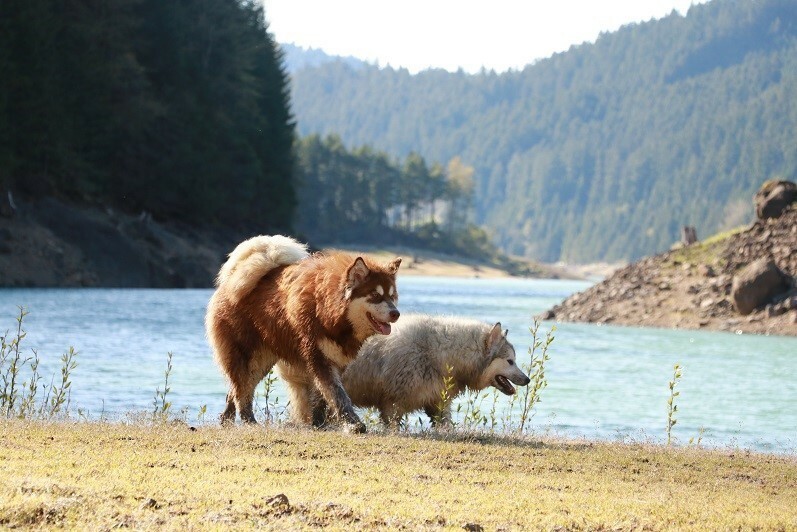 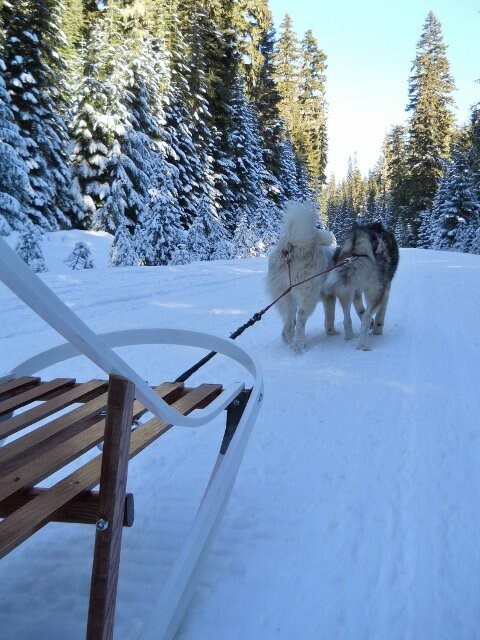 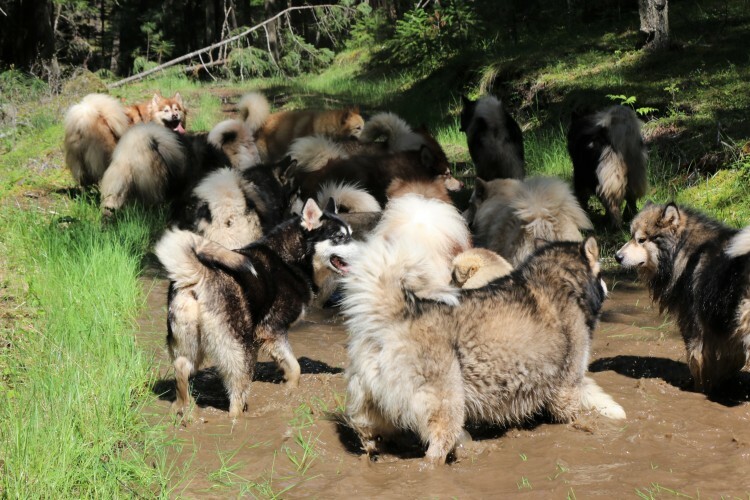 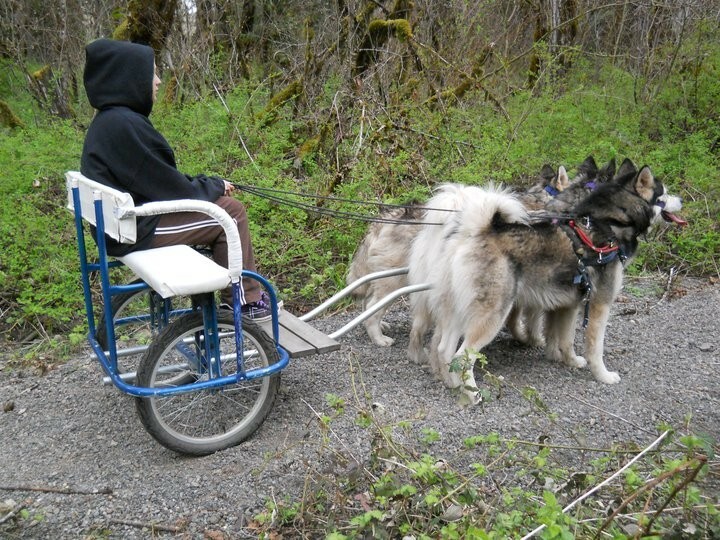 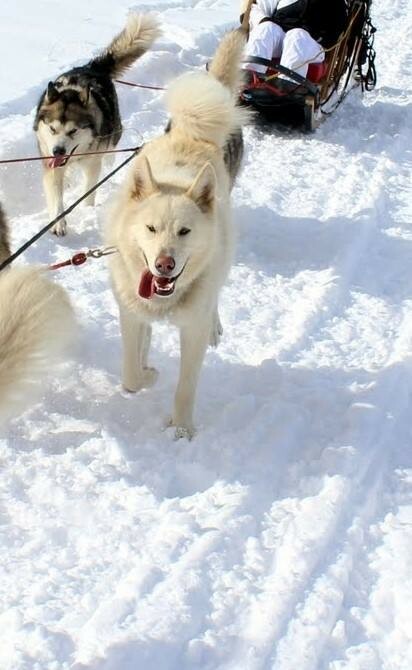 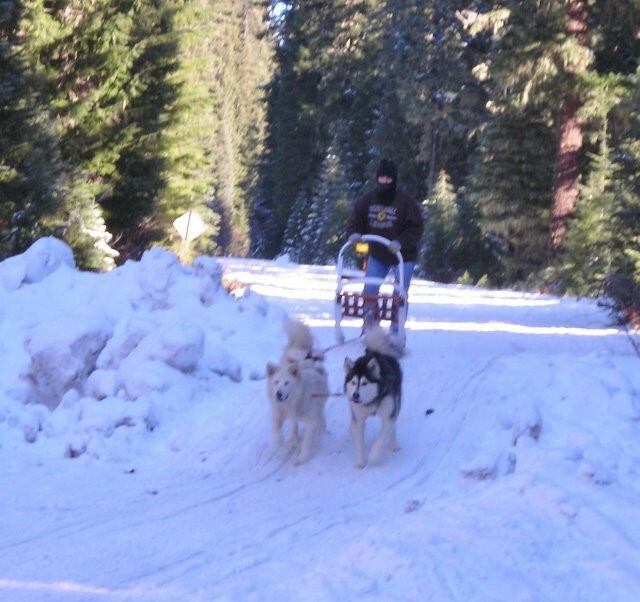 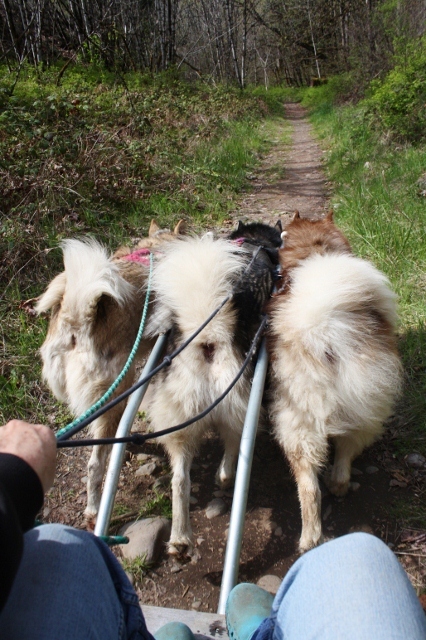 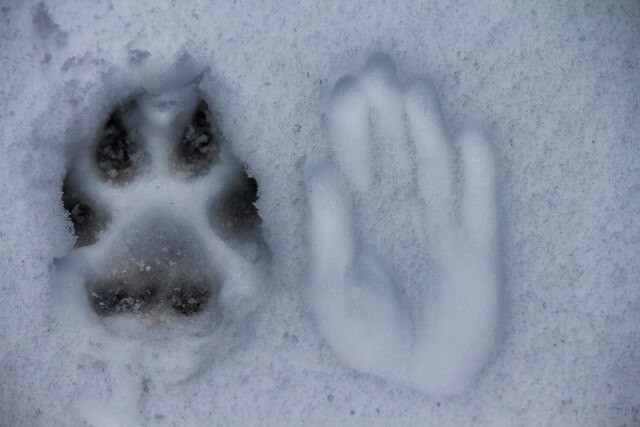 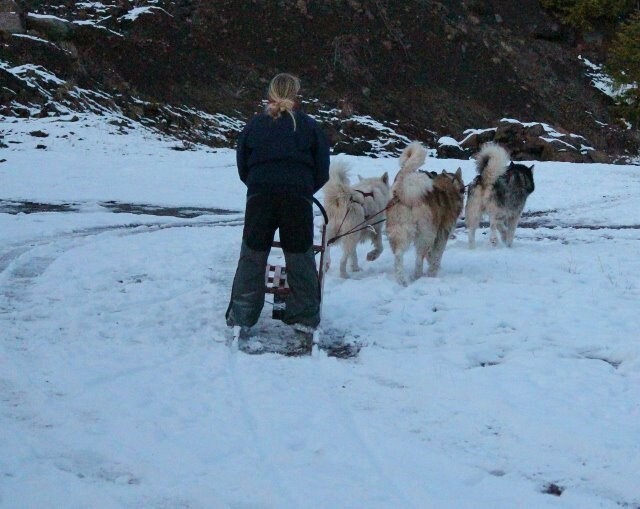 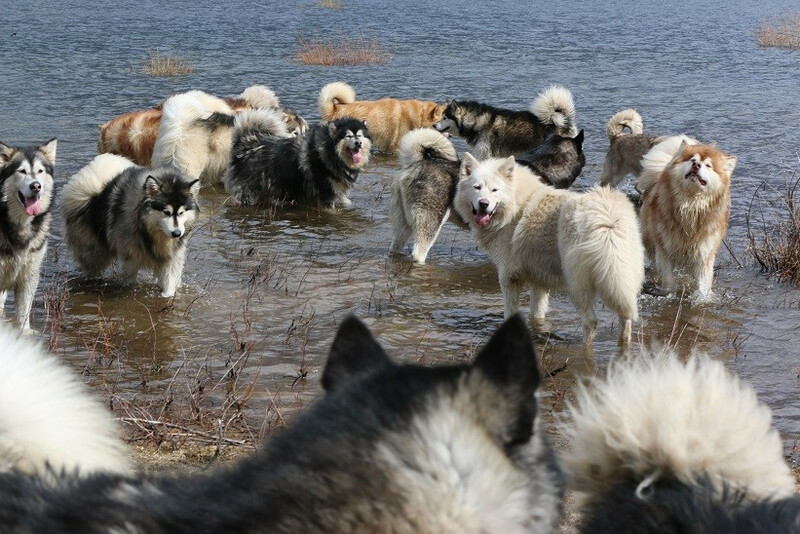 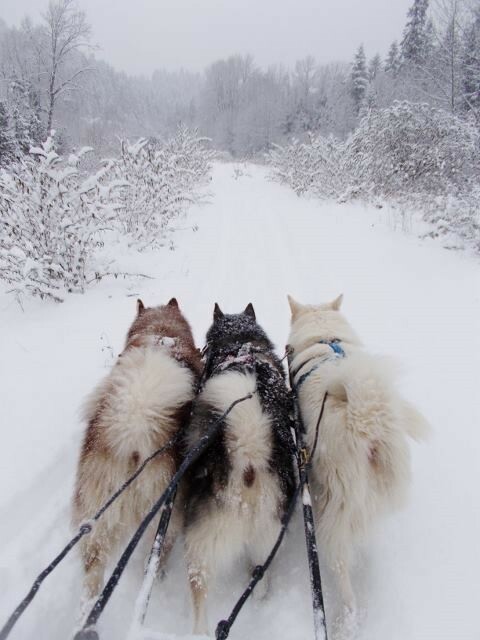 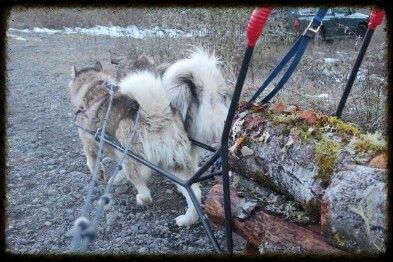 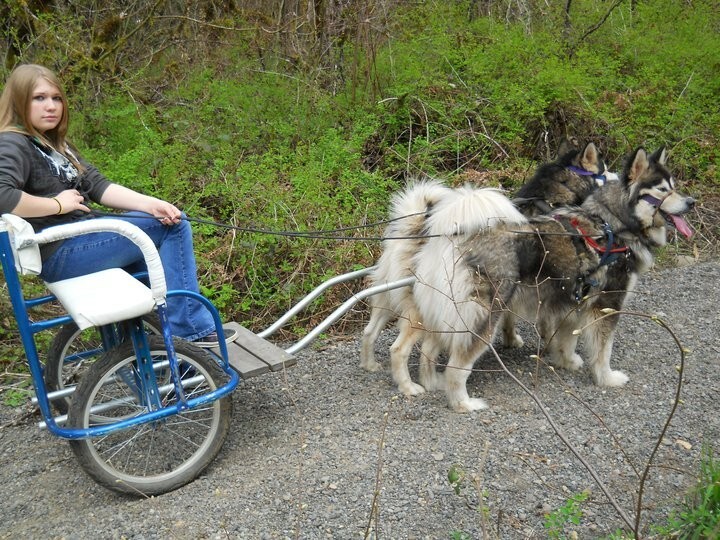 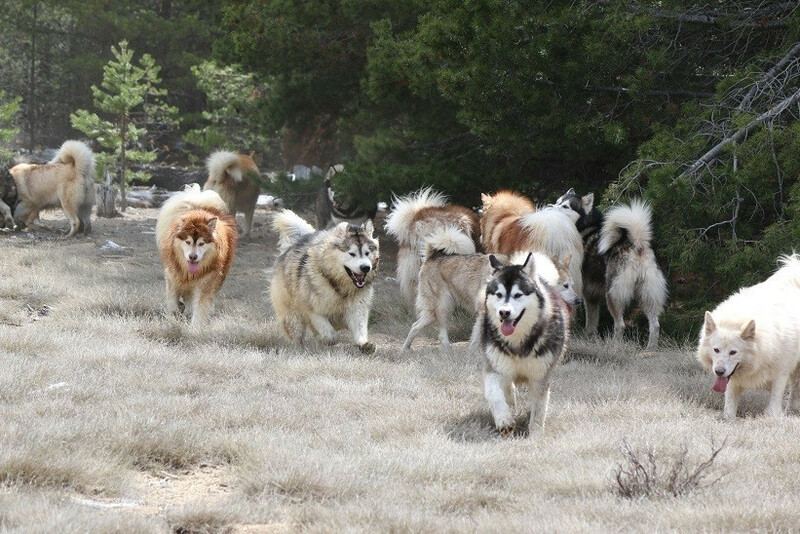 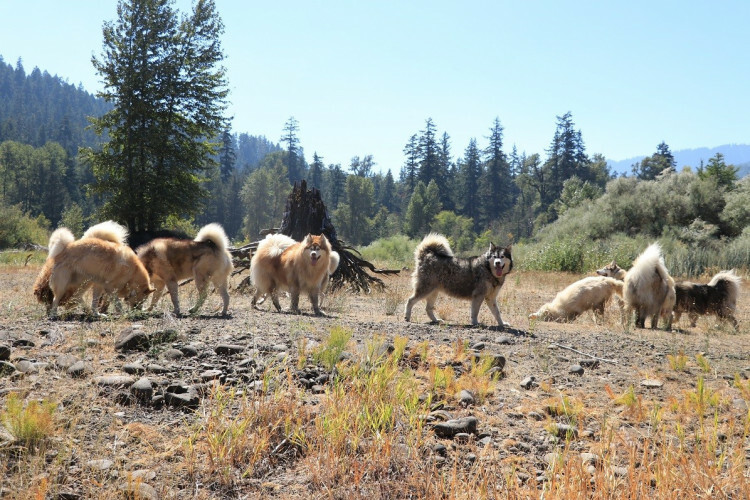 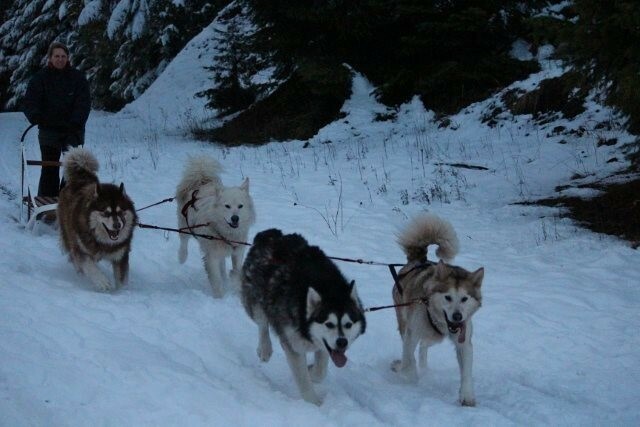 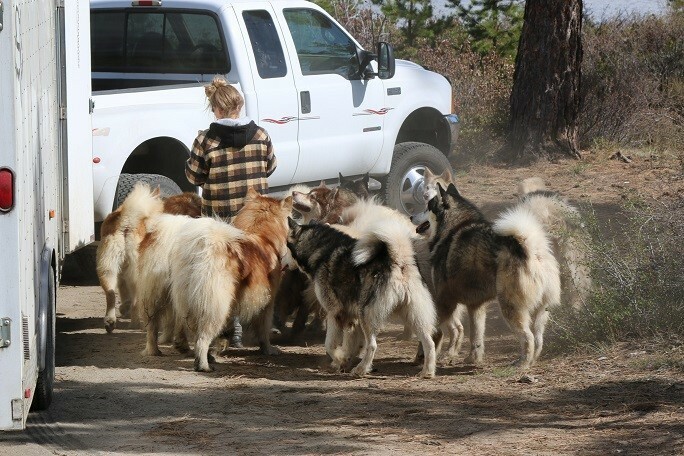 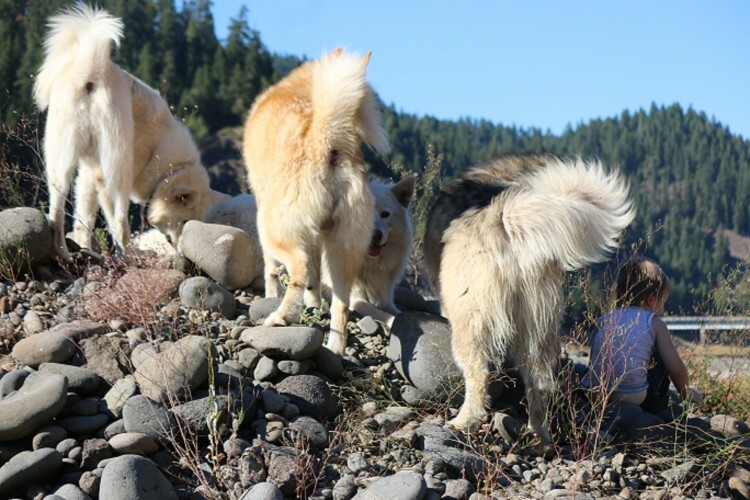 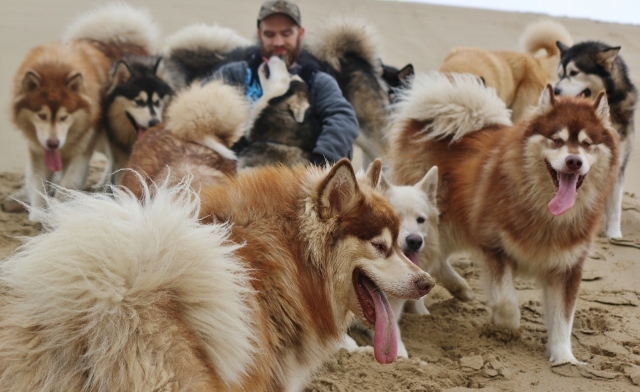 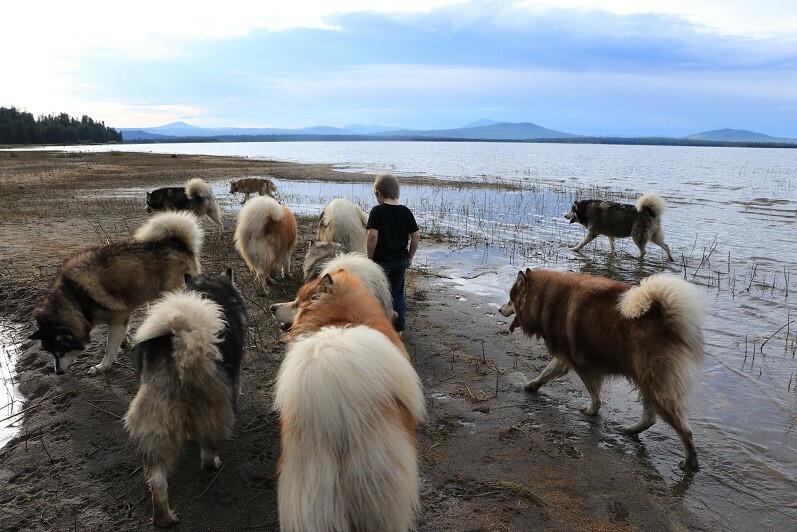 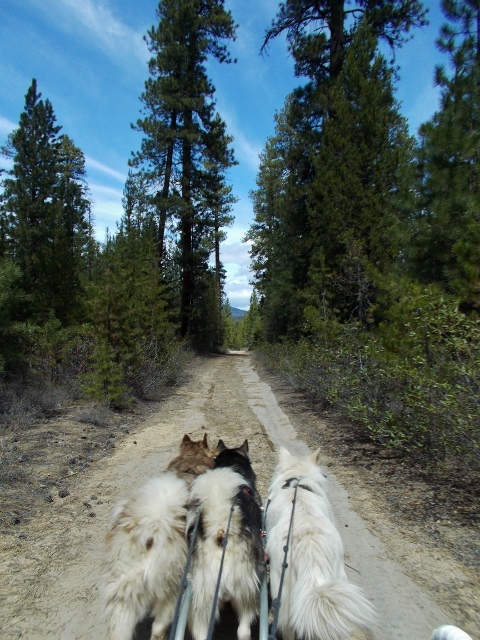 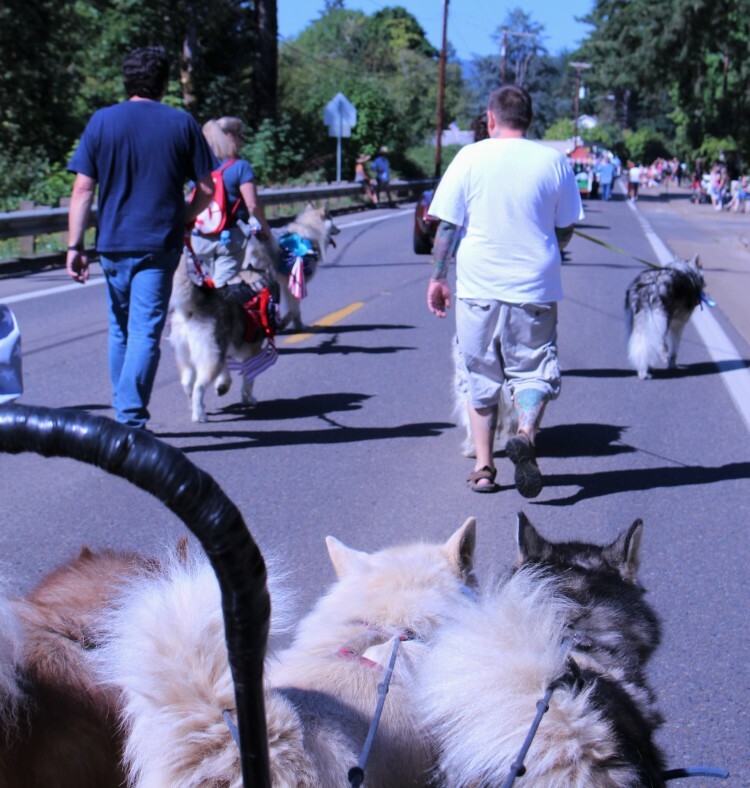 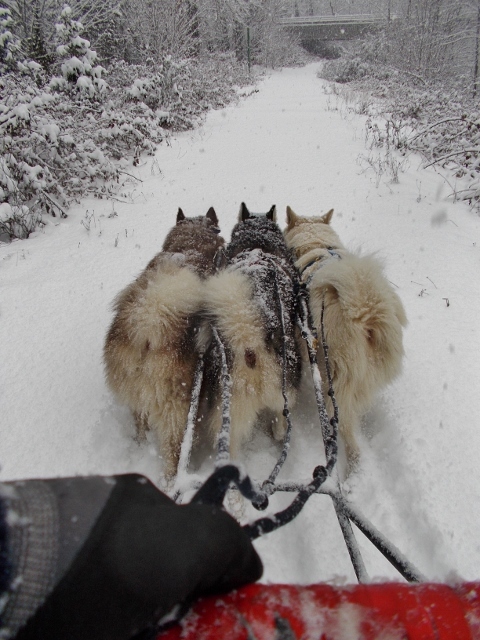 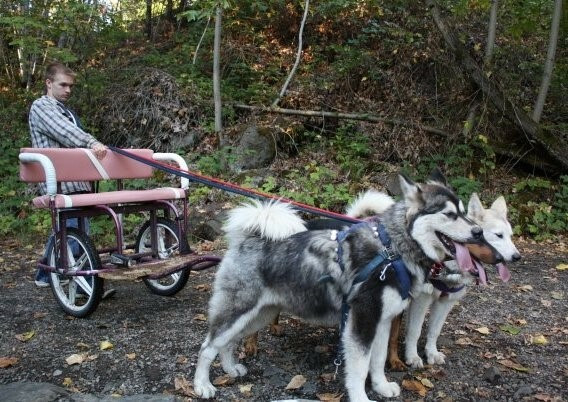 Our Alaskan Malamutes live and work as a team with us in all Weather and conditions. 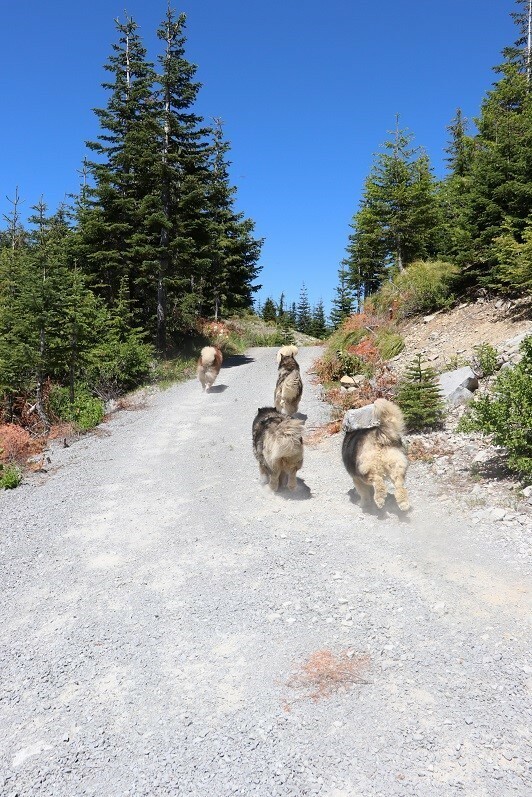 They enjoy days of play and freedom that we have been told is not typical of the breed- playing off lead, with freedom to do as they please ( including go off on their own or chase other animal, if they so chose- which they never do ) They stay together and stay with us while we hike. 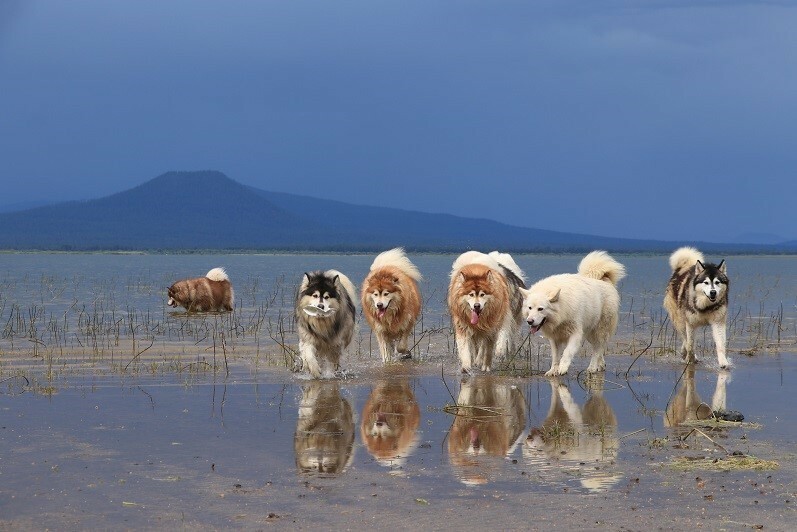 We are very proud of our Crew and they know it. 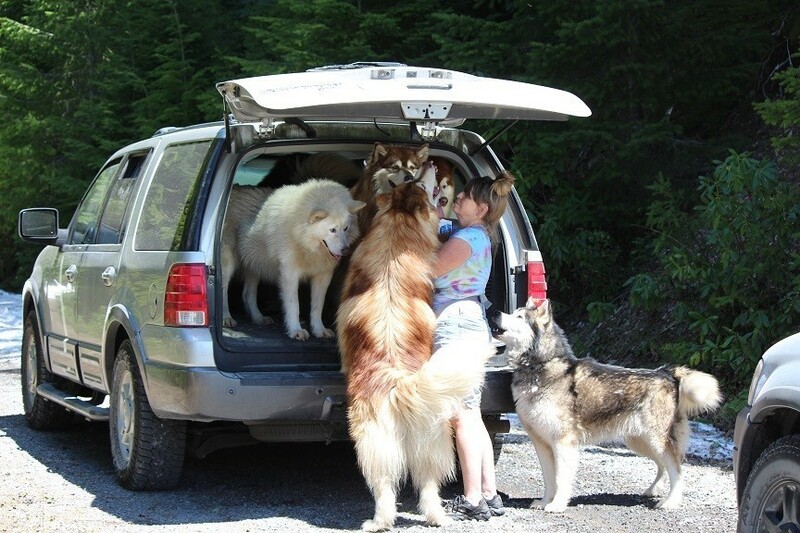 When we take a vacation the crew goes with us. 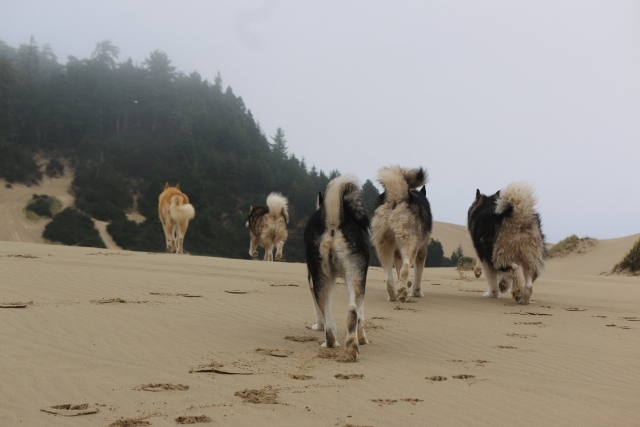 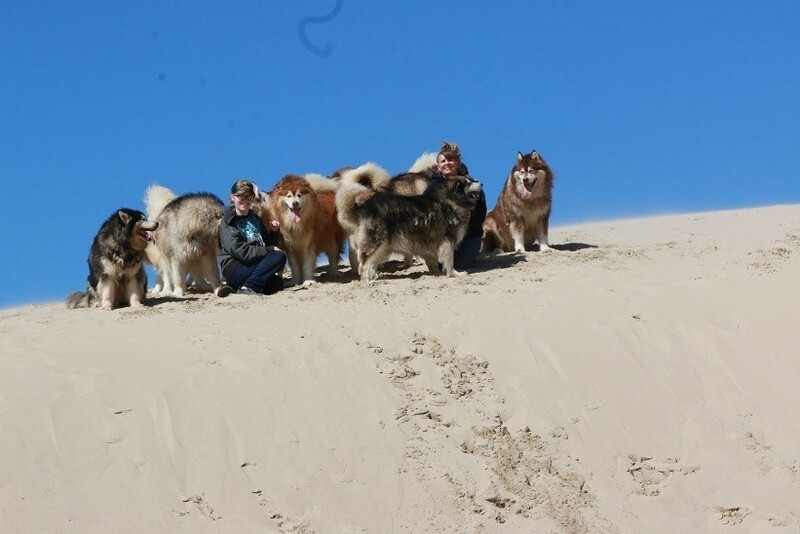 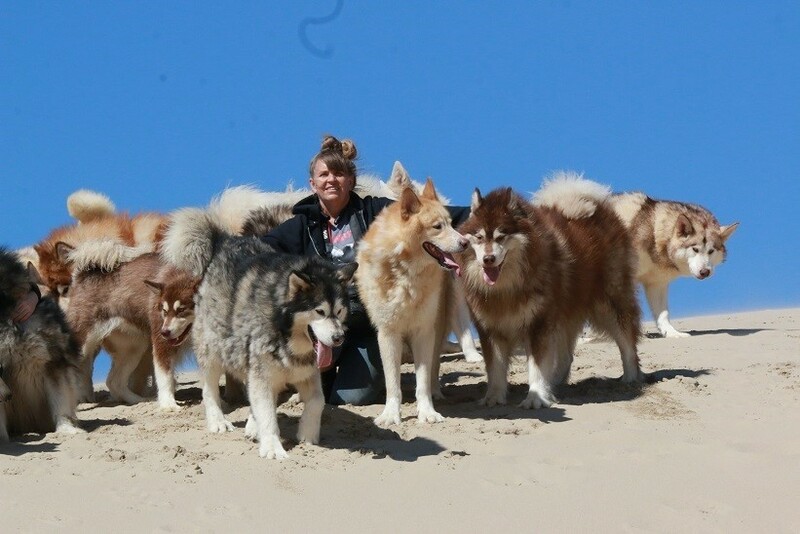 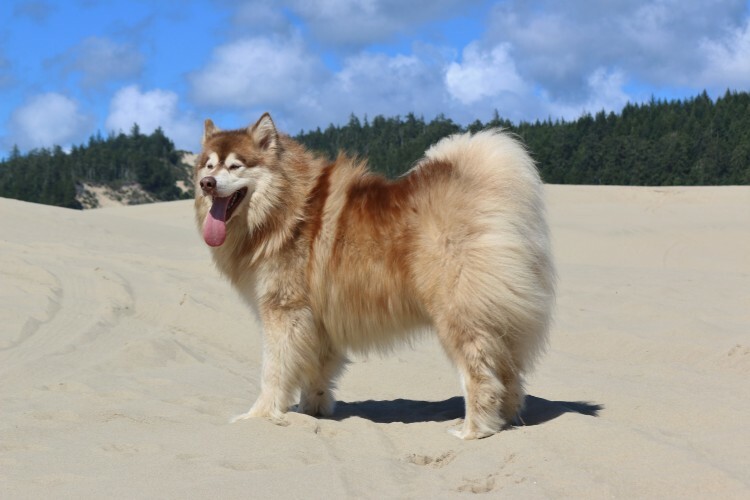 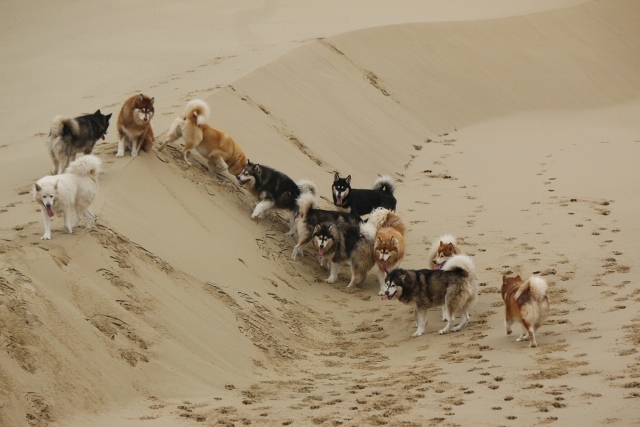 The Oregon dunes is a place we go every year as a family, and all of our dogs go with us. 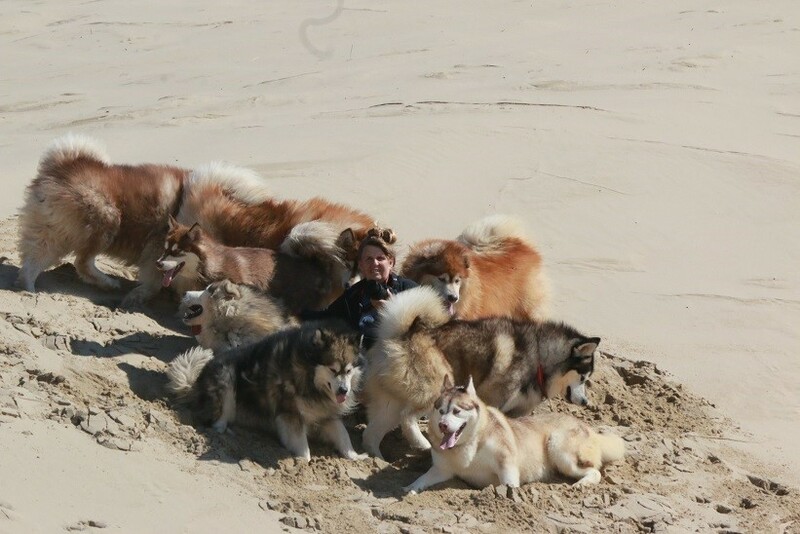 They love the sand and it is a great workout for them and for us. 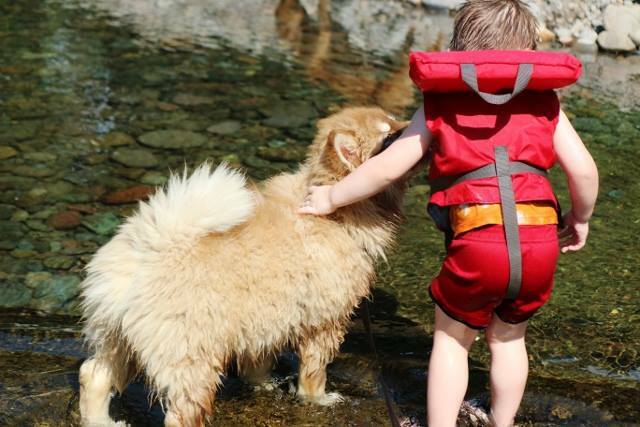 Our 3 year old Grandson, spending time by the creek with one of our puppies. 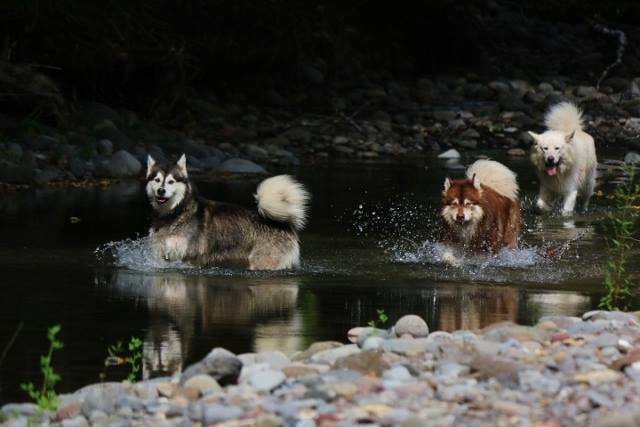 Both learning to swim. 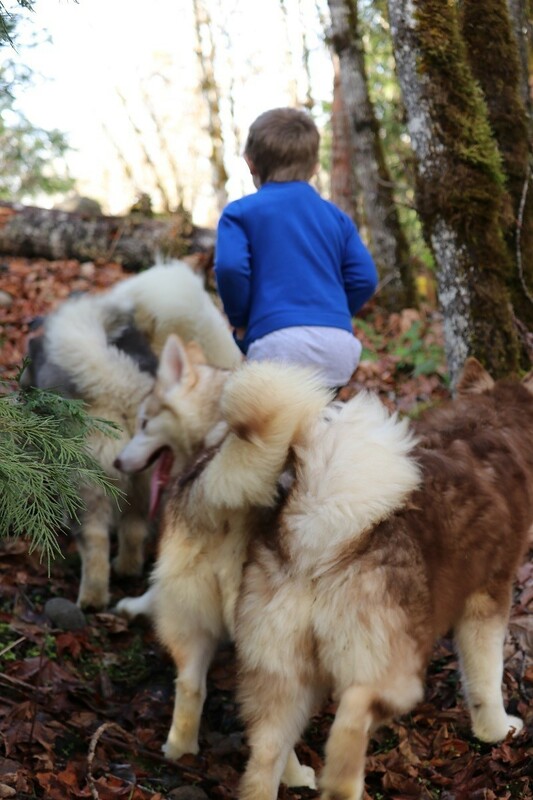 Brody teaching Winter about the art of wearing shoes lol..
Recall is something to see with the crew on our hikes. 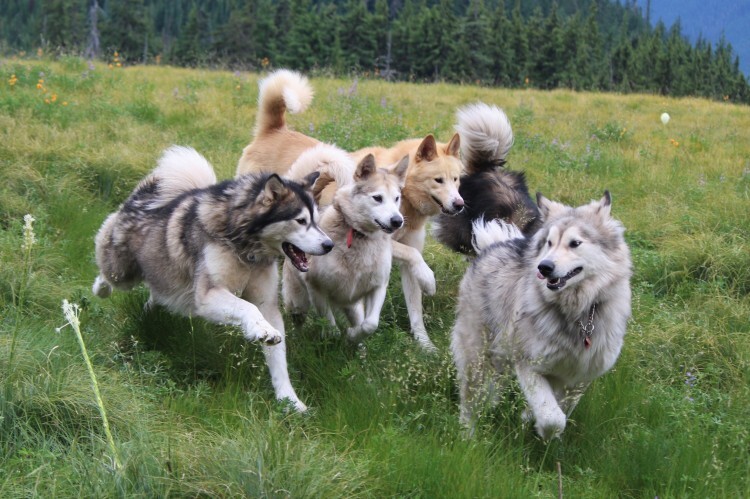 They come running. 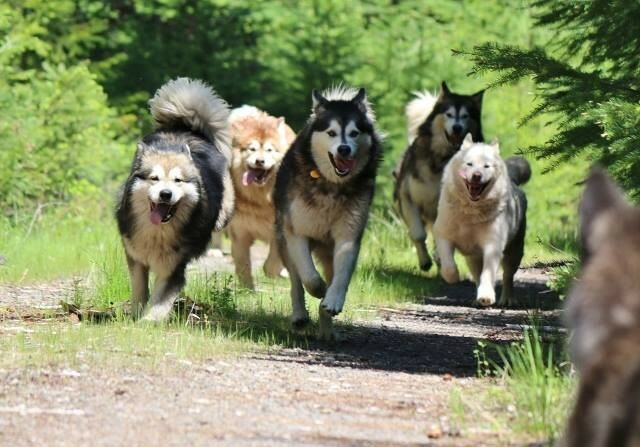 Working is just as important to these guys as playing. 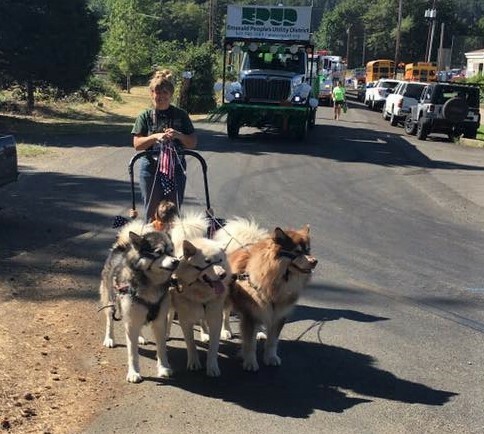 They were bred to do a job and they Love their work. 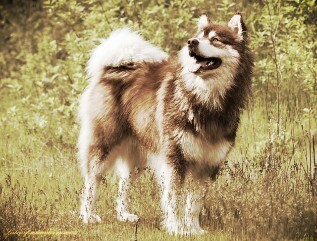 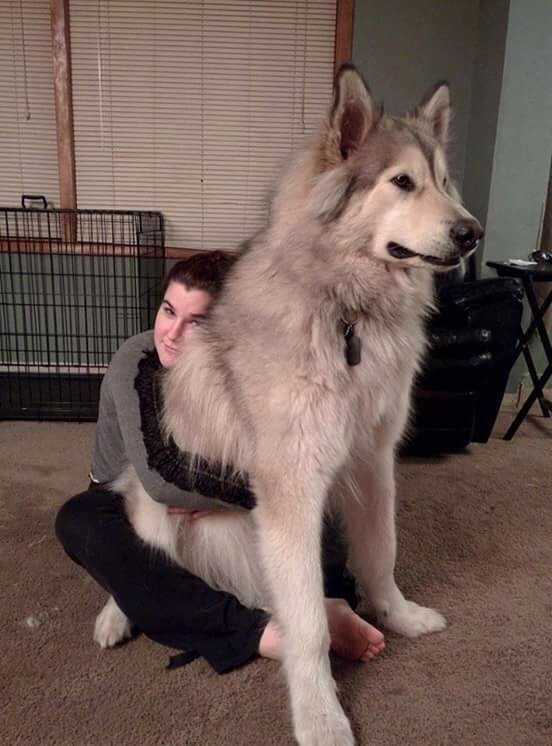 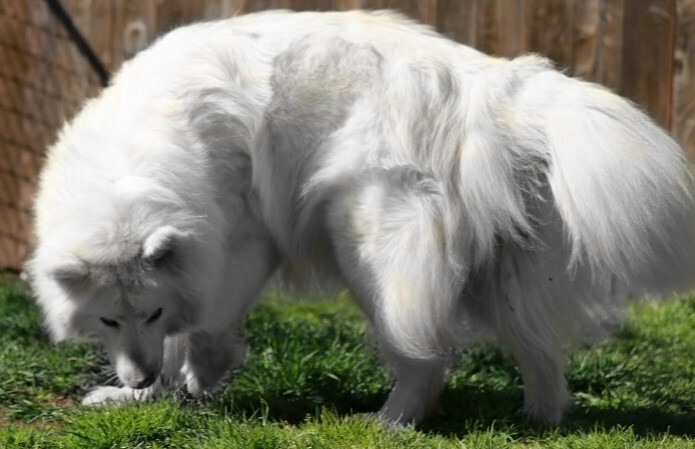 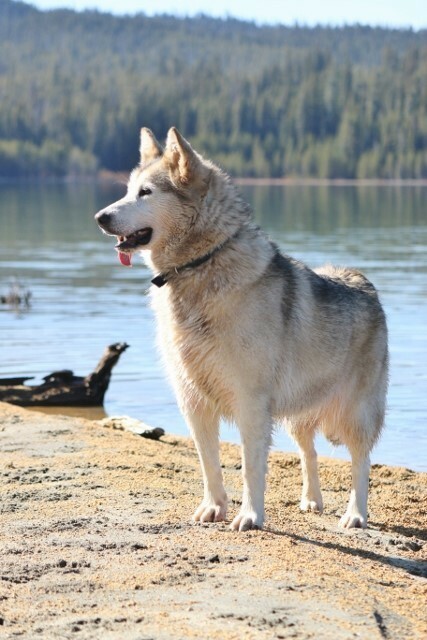 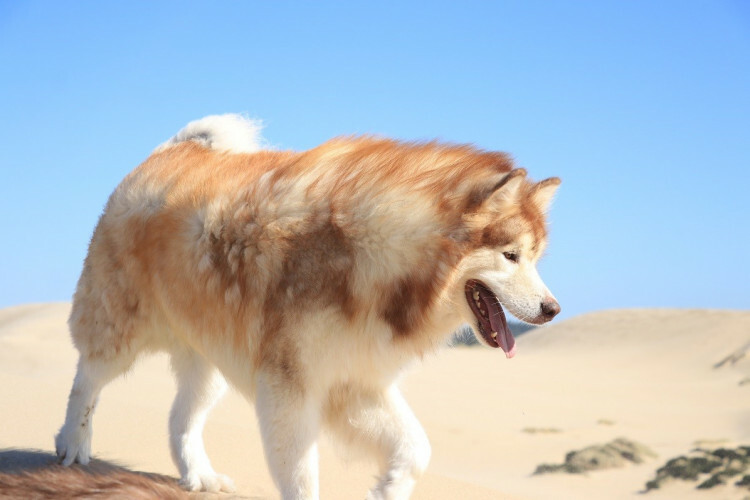 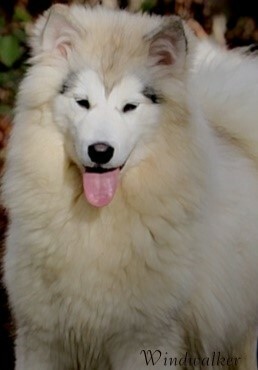 Alaskan Malamutes are the Work horse of the Arctic breeds. 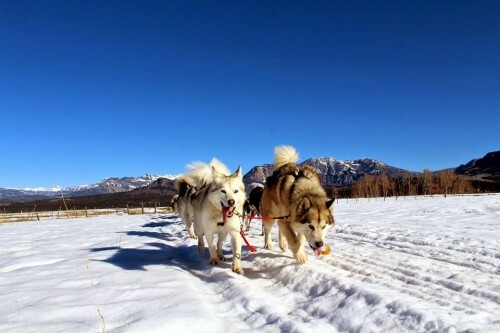 They were not meant to go fast, but to pull heavy loads in the harshest climate imaginable. 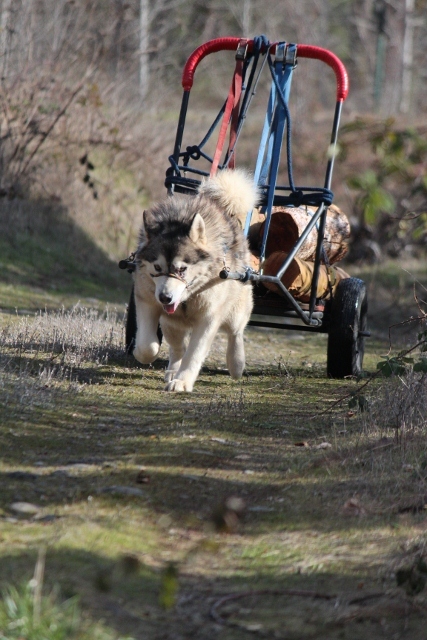 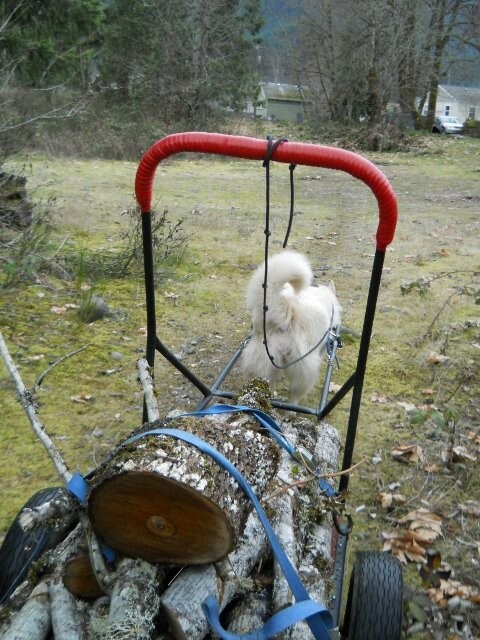 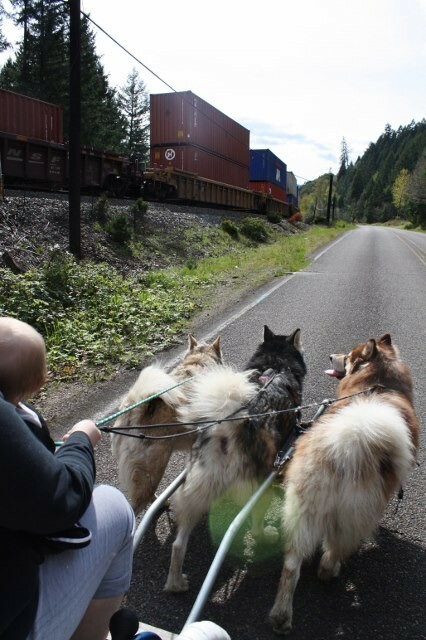 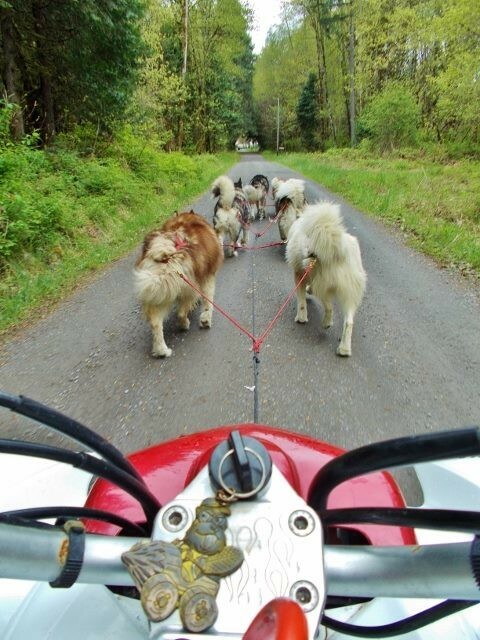 We pull the ATV's, Carts and Sleds with the crew and they Love it all. 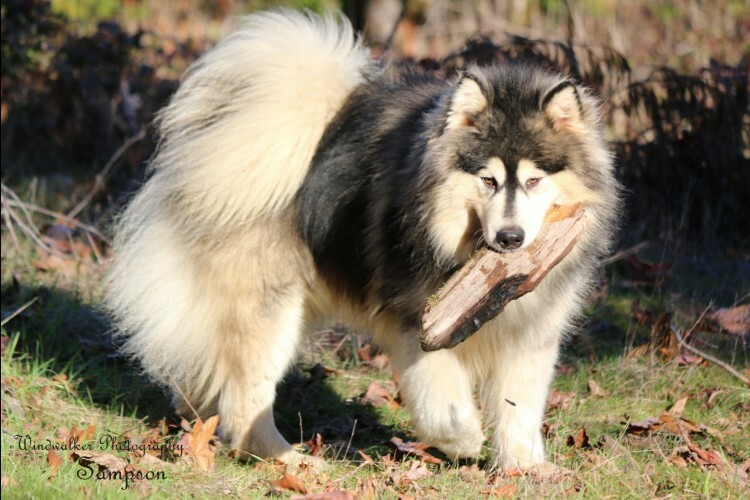 Working is what the Malamute was Bred to do. 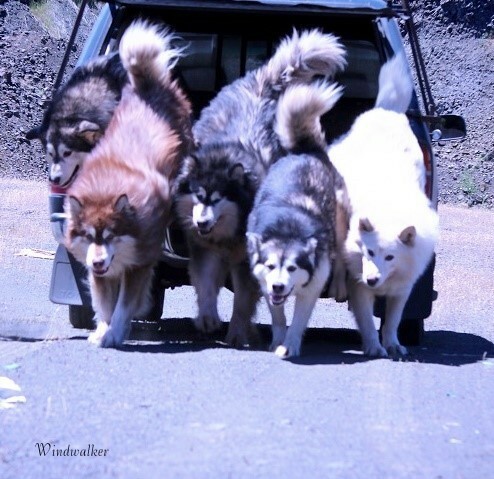 They are Strong, willing, hard working dogs, that Love their Jobs. 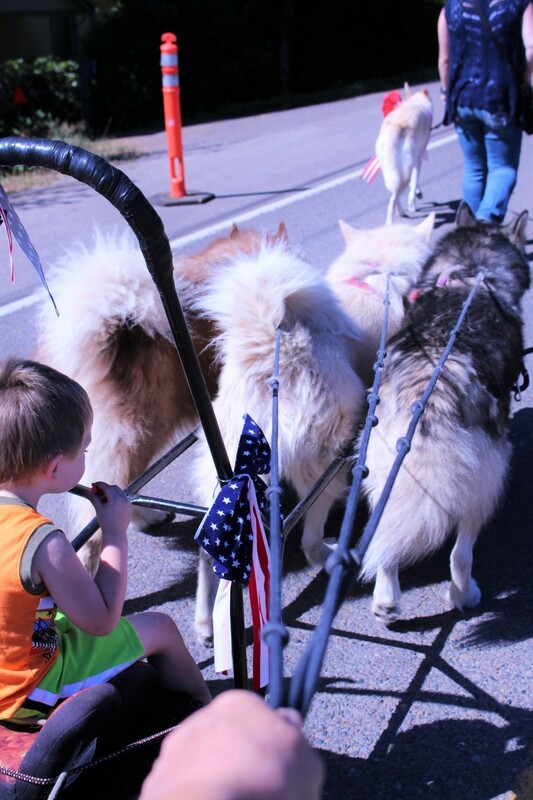 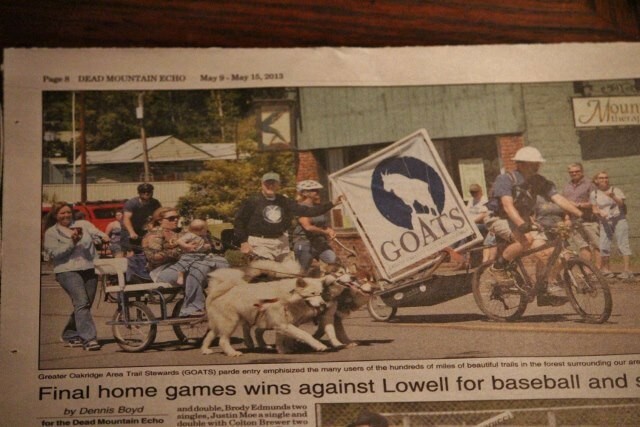 ​​We have been invited to several parades this year and have had a wonderful time attending them. 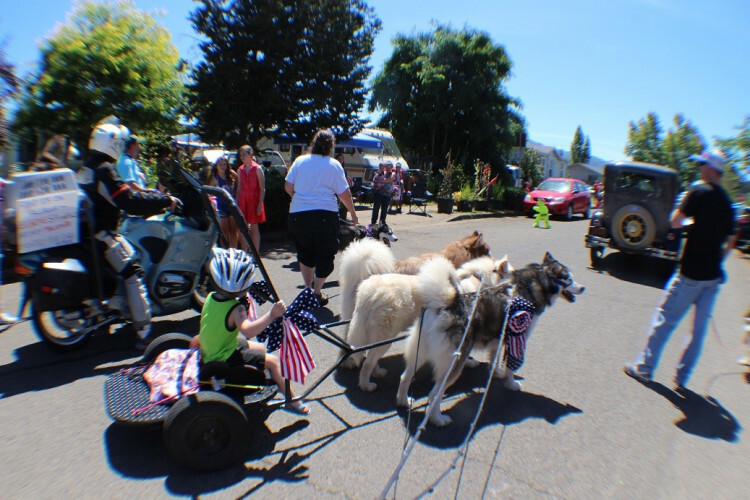 This year we will be building a custom Covered wagon for future parades. 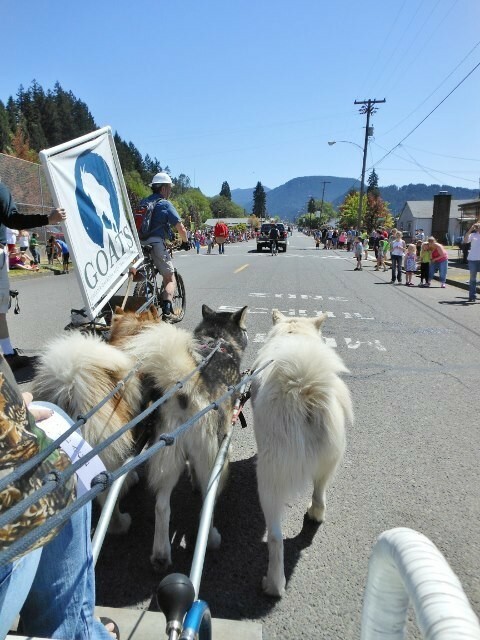 These photo's were take at the Mary Cole Days Parade in Marcola Oregon August 6 2016. 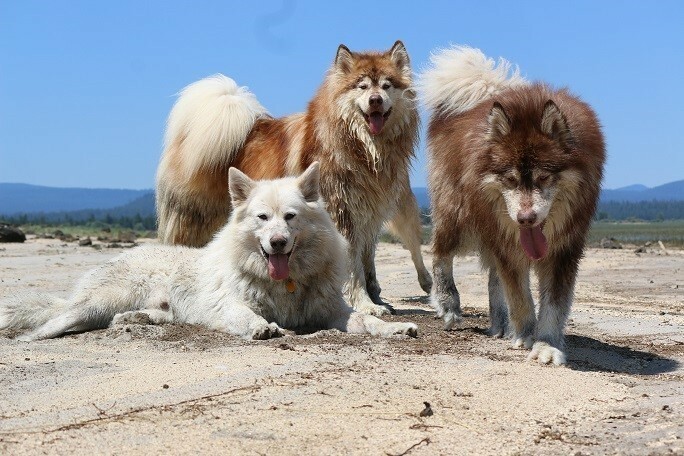 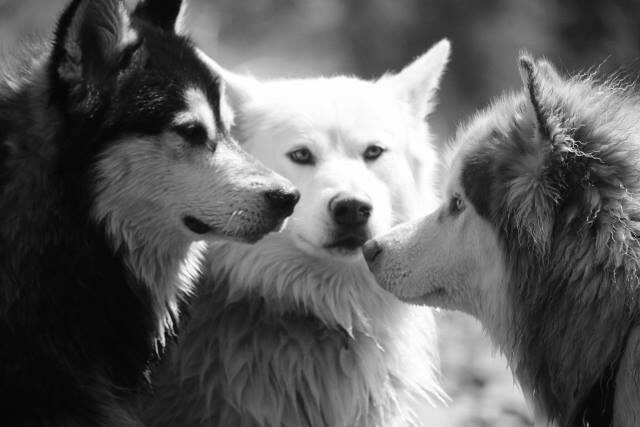 ​​Looking at the photo from left to right - The member are : Cooper, Taki and Laku. 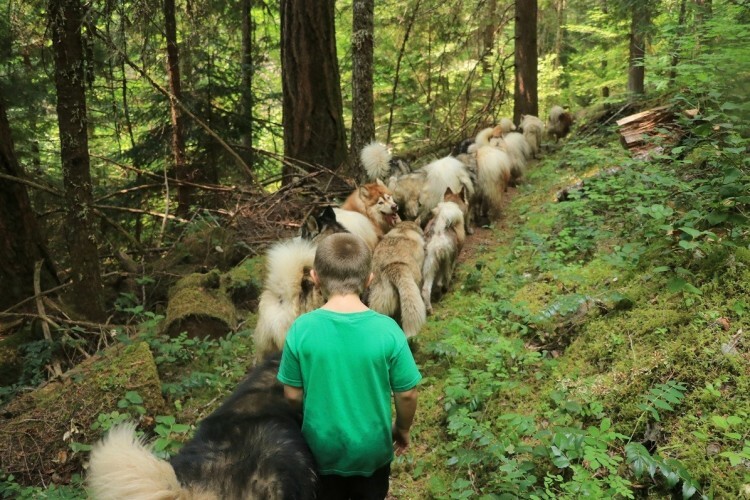 Hiking with Brody and 17 of the crew. 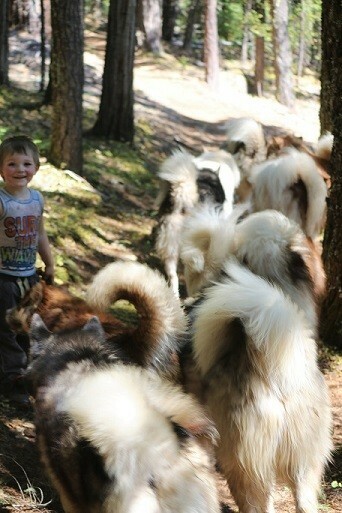 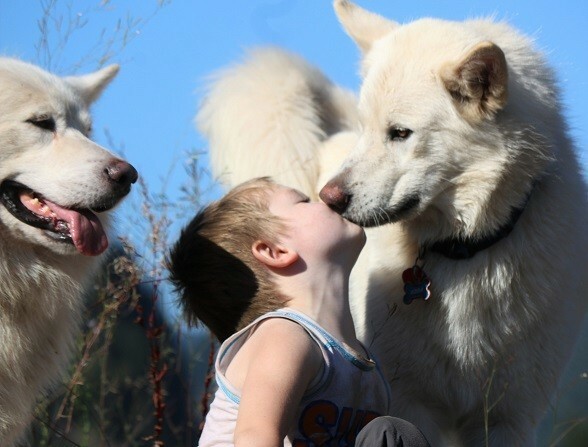 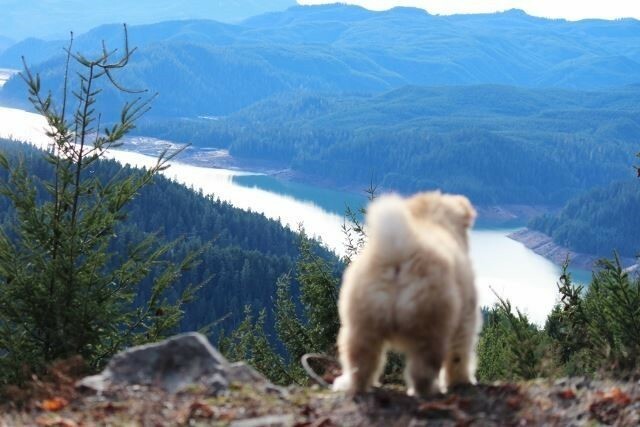 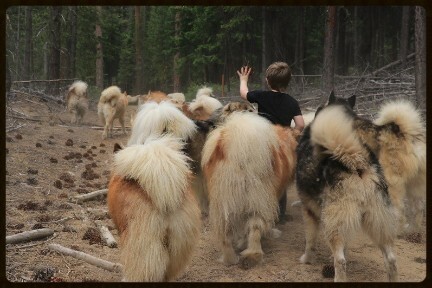 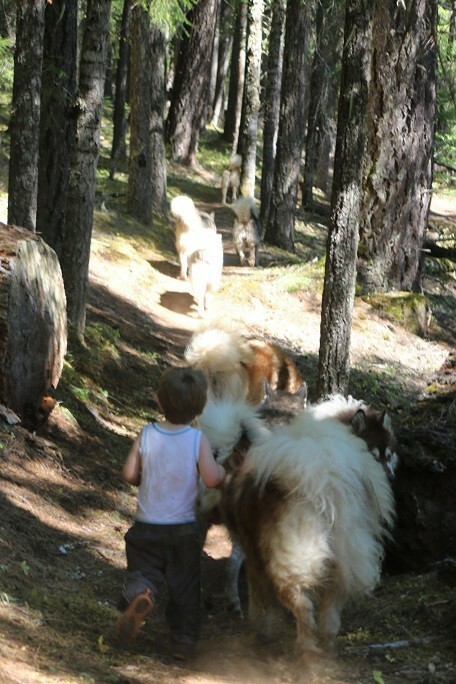 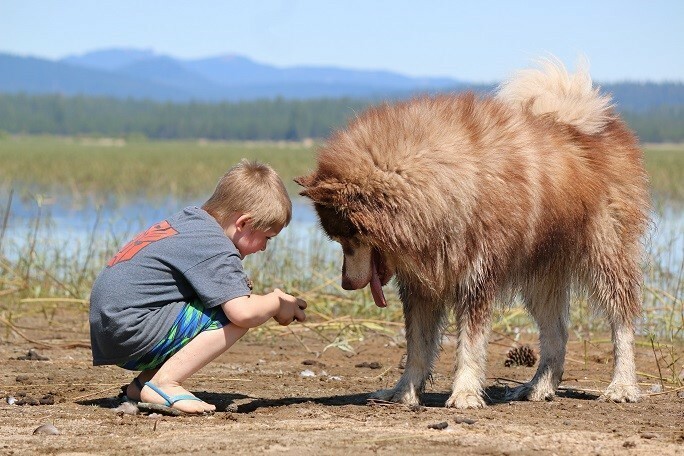 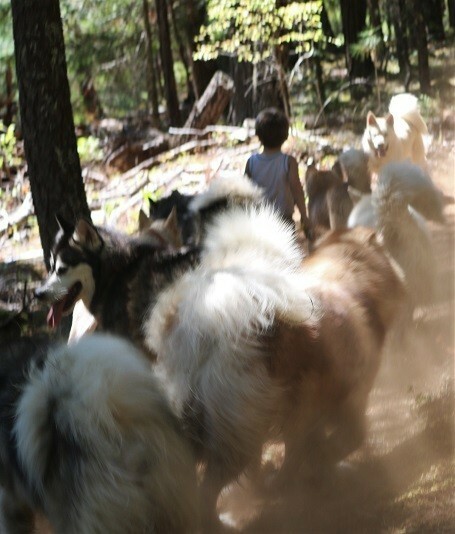 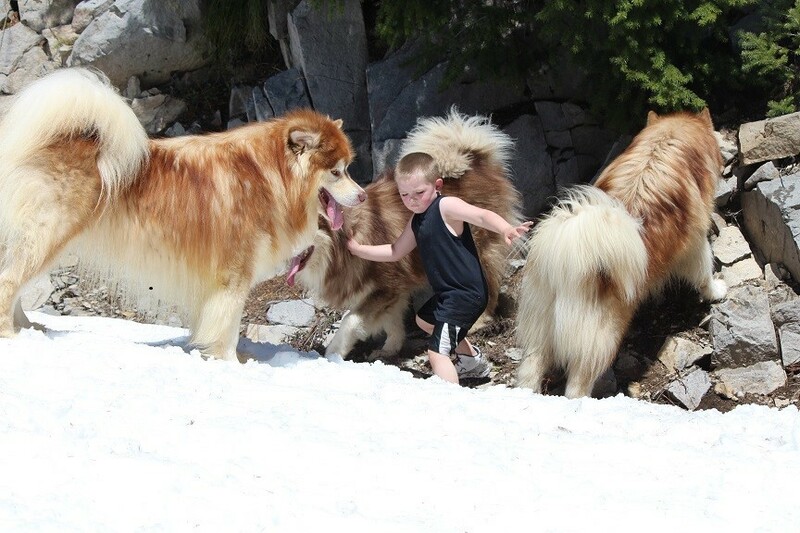 Though he is only 4 years old, the crew knows they have to be careful when hiking with him. 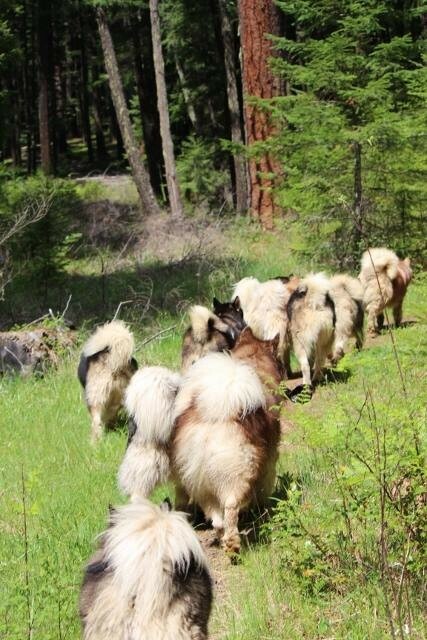 They all take turns keeping a watchful eye on him as we head up the trail. 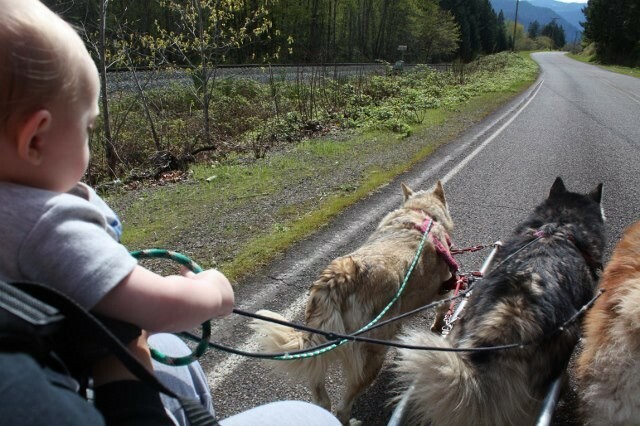 Training here begins early- baby HOPE learning to cart at 11 weeks. 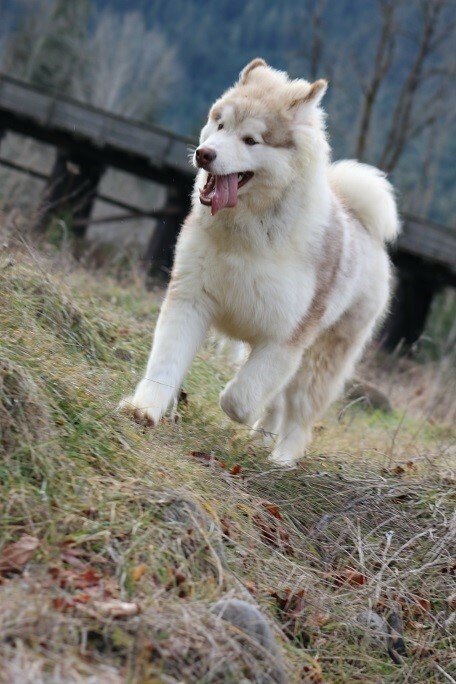 No weight and very brief lessons for the first 6 months. 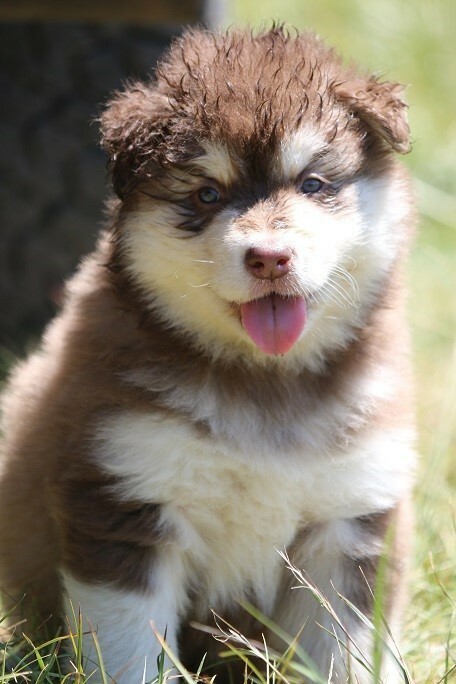 The first months of a puppies life are crucial to their abilities when they are grown. 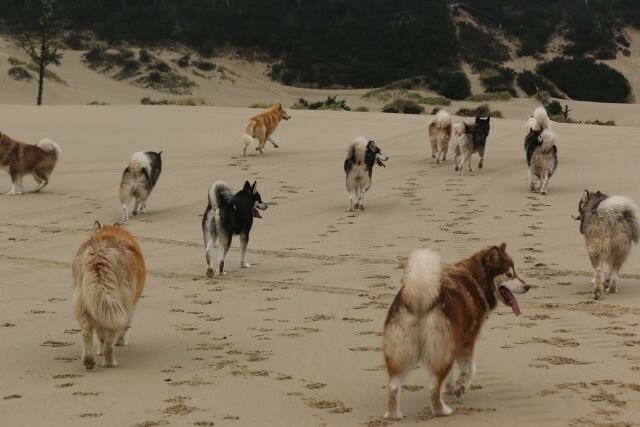 Spending the day with 17 .